The Miami Hurricanes football team represents the University of Miami in the sport of American football. The Hurricanes compete in the National Collegiate Athletic Association (NCAA)'s Division I Football Bowl Subdivision (FBS) and the Coastal Division of the Atlantic Coast Conference (ACC). The program began in 1926 and has won five AP national championships (1983, 1987, 1989, 1991, 2001). The Miami Hurricanes are among the most storied and decorated football programs in NCAA history. Miami is ranked fourth on the list of All-time Associated Press National Poll Championships, tied with Southern California and Ohio State and behind Alabama, Notre Dame, and Oklahoma. Miami also holds a number of NFL Draft records, including most first-round selections in a single draft and most consecutive drafts with at least one first-round selection. Two Hurricanes have won the Heisman Trophy and nine have been inducted to the College Football Hall of Fame. The team plays its home games at Hard Rock Stadium in Miami Gardens, Florida. The Hurricanes' head coach is currently Manny Diaz. The first University of Miami football team, 1926. The University of Miami football program began with just a freshman team in 1926. Its first game was played on October 23, 1926, a 7–0 win over Rollins College before 304 fans. Under the guidance of head coach Howard "Cub" Buck, the freshman team posted a perfect 8–0 record in its inaugural season. Two of the wins were against the University of Havana, one on Thanksgiving Day in Miami and one at Havana on Christmas Day. Miami's last home game of the season featured a first: the first Hurricane football game played on New Year's Day against Howard at Miami's University Stadium. Around this time, the team adopted the official nickname "Hurricanes", though the exact timing and origin of the name is unclear; some reports suggest it was in reference to the devastating power of the 1926 hurricane that postponed the program's first game by a month, and others that it was suggested by a player in response to rumors that university officials wanted to name the team after local flora or fauna. Varsity competition began in 1927, with Miami beating Rollins, 39–3, in its first game and going on to a 3–6–1 record. The team improved to 4–4–1 in 1928, but it was not enough for Buck to keep his job, and he was replaced prior to the 1929 season with J. Burton Rix, previously head coach at Southern Methodist. Rix's arrival was funded by a group of local businessmen. That off-season, the program, which competed as an independent during its first two years of existence, joined the Southern Intercollegiate Athletic Association (SIAA). 1929 saw Miami play its first varsity road game (a 14–0 loss at Southwest Louisiana), and Rix led the team to its first winning season, going 3–2. His tenure, however, was short-lived; off-campus financing for the program dried up in the wake of the 1929 stock market crash, and he resigned after one season. Ernest Brett replaced Rix, and in 1930, Miami played Temple in its first game outside the South, losing 34–0 to the Owls in Atlantic City, New Jersey. On October 31, 1930, the Hurricanes played in one of the nation's first night games vs. Bowden College in Miami. Brett only lasted one year, and Tom McCann became the program's fourth head coach in 1931. Under McCann, the football program experienced its most successful seasons to that point. After a difficult first year, Miami put together a winning record in 1932 and served as host to the inaugural Palm Festival (later to be known as the Orange Bowl), defeating Manhattan College 7–0 at Moore Park in Miami. A 5–1–2 campaign and another Palm Festival berth followed in 1933, and in 1934, the program played in its first official bowl game, losing to Bucknell in the first Orange Bowl, 26–0. In 1935, a group of Miami football supporters sought to hire Red Grange as coach. However, the move was vetoed by President Bowman Foster Ashe, in part because of the $7,500 salary that Grange had requested. Instead Irl Tubbs took over as head coach in 1935, and though Miami compiled an 11–5–2 record in his two seasons, it did not play in a bowl in either year. After Irl Tubbs resigned following the 1936 season to become head coach at Iowa,[self-published source] Jack Harding was hired to serve as both head football coach and athletic director at Miami. In 1937, the Hurricanes moved into the brand new Burdine Municipal Stadium (renamed the Orange Bowl in 1959), located west of downtown Miami. The following year, Miami played archrival Florida for the first time, defeating the Gators 19–7 at Florida Field, and won the program's first Southern Intercollegiate Athletic Association title with an 8–2 record. The Hurricanes, though, left the SIAA just three years later, becoming an independent once again. Harding led the Hurricanes to eight- and seven- win campaigns in 1941 and 1942, respectively, before he was called away by World War II service. Eddie Dunn, a former star running back at Miami under Harding, stepped into the void and served as head coach during Harding's two-year war service. Though the Hurricanes won five games in 1943, they faltered in 1944, winning just one game against seven losses and a tie. Fortunes changed with Harding's return in 1945, as the Hurricanes went 9–1–1 and returned to the Orange Bowl for the first time since 1934, defeating Holy Cross 13–6 in a memorable game. With the score tied 6–6 and only seconds remaining, Holy Cross quarterback Gene DeFilippo was intercepted by Miami's Al Hudson at the 11-yard line. Hudson dashed 89 yards the other way for the game-winning touchdown as time expired. Harding's Hurricanes won eight games in 1946, but after the team slipped to 2–7–1 in 1947, he resigned as head coach, but continued as athletic director. He hired Andy Gustafson as the new head coach, closing out a nine-year tenure in which Miami went 54–29–3 and won at least 8 games in four different seasons. One of Andy Gustafson's major innovations at Miami was the "drive series" offense, an option-oriented attack from the Split-T formation that relied on zone blocking and featured either a fullback fake or carry on every play. Under Gustafson's tutelage, Miami produced its first All-American, Al Carapella, in 1950 and went 9–1–1 in 1951, including a 35–13 win in its first-ever game against rival Florida State and a 15–14 loss to Clemson in the Orange Bowl. The following season, Miami won eight games and went to a bowl game in consecutive years for the first time in school history, shutting out Clemson 14–0 in a rematch at the Gator Bowl. In the middle of the 1954 season, the NCAA imposed two one-year penalties against Miami for providing transportation and tryouts to prospective players. As a result, Gustafson's 1954 squad was ineligible to play in a bowl game, and the 8–1 Hurricanes, whose lone loss came 14–13 at #14 Auburn, finished the season ranked ninth in the Coaches' Poll, the first top ten poll finish in school history. Two years later in 1956, an 8–1–1 Miami team, led by team captain and All-American Don Bosseler, was under consideration to play in the Sugar Bowl, but the program's bowl-ban was not due to expire until ten days after the game, rendering it ineligible to participate. The team finished the season ranked sixth in both the AP and Coaches' Polls. In the later years of Gustafson's tenure, two-time All-America quarterback George Mira guided the Hurricanes to berths in the 1961 Liberty Bowl and the 1962 Gotham Bowl, where they lost both games. In 1963, the team struggled to a 3–7 record. Nevertheless, Mira, who set many of the school's passing records during his four years at Miami, appeared on the cover of Sports Illustrated and finished fifth in the Heisman Trophy voting as a senior. Following the season, Gustafson decided to step down as head coach and Charlie Tate, an assistant at Georgia Tech, was hired to replace him. Gustafson has the Hurricane record for most years as head coach (16) and most wins (93). Charlie Tate's first seasons at Miami were uneventful, with the team posting a 4–5–1 record in 1964 and a reverse 5–4–1 record in 1965. 1966 brought the arrival of defensive end Ted Hendricks, the only three-time All-American in school history, and the Hurricanes won eight games, earning a trip to the Liberty Bowl, where they defeated #9 Virginia Tech, 14–7. In December 1966, the program was integrated when African-American wide receiver Ray Bellamy signed a letter of intent to play football at the university. Miami returned to bowl play in 1967, dropping the Bluebonnet Bowl to Colorado, 31–21. The Hurricanes had a 5–5–0 season in 1968 and 4–6–0 in 1969, and Tate resigned as head coach two games into the 1970 season, later citing burn out and fatigue from "fighting the money battle and other battles" as the basis for his decision. Walt Kichefski, an assistant on Tate's staff, was elevated to head coach in the wake of Tate's resignation and coached the team to a 3–8 record in 1970. He was not retained the following season. On December 20, 1970, Fran Curci, a former All-American quarterback for the Hurricanes under Andy Gustafson, was named as the program's new head coach. Curci's 1971 team improved by a game, but rival Florida Gators defeated Miami in a game that came to be known as "the Florida Flop." With Florida leading 45–8 late in the fourth quarter, the Gator defense allowed Miami to score so that Florida would get the ball back and quarterback John Reaves would have the opportunity to gain the 15 yards he needed to break the NCAA record for career passing yards.1972 brought another memorable finish for Miami, when the inadvertent gift of a "fifth down" by officials enabled the Hurricanes to edge Tulane in the waning moments of the game for a 24–21 win. Curci left the program at the conclusion of the season and was replaced by Pete Elliot. Elliot, in turn, lasted two seasons and stepped down in 1975 to become Miami's athletic director. 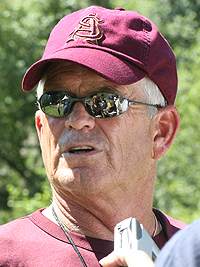 Offensive coordinator Carl Selmer was named the program's fifth head coach in six years. Under Selmer, a trend that started earlier in the decade continued, with home attendance declining every year. After finishing 2–8 in 1975 and 3–8 in 1976, the university fired Selmer, citing concerns about dwindling attendance and the loss of local blue-chip recruits to other schools. After a national search, Lou Saban, formerly head coach of the NFL's Buffalo Bills, Denver Broncos, and Boston Patriots, was hired on December 27, 1976, as head coach. Miami only won three games in 1977, but Saban was able to put together a well-regarded recruiting class that included future Pro Football Hall of Fame quarterback Jim Kelly of East Brady, Pennsylvania. Kelly had been recruited by Penn State as a linebacker and agreed to come to Miami after Saban promised him he would play quarterback. Among the other 30 signees in Saban's first recruiting class were 11 future NFL players. The Hurricanes improved by three games in Saban's second season and Ottis Anderson emerged as an NFL talent. Anderson became the first Miami running back to rush for 1,000 yards in a season and led the team in rushing for three straight seasons from 1977 through 1979. Anderson set numerous school rushing records and was Miami's career rushing leader until 2014, when he was overtaken by Duke Johnson. After just two seasons as head coach, Saban resigned in the wake of a controversy concerning football players throwing a Jewish man into Lake Osceola, an on campus lake. He left after the 1978 season to take the head coaching position at Army. Saban's departure, the constant coaching upheaval Miami experienced during the decade, and assorted fiscal problems sparked the university's board of trustees to hold a vote on whether to drop the football program down to the Division I-AA level or eliminate it altogether. University executive vice president Dr. John Green was able to convince the board to give Division I-A football another shot and hired Howard Schnellenberger, offensive coordinator for the NFL's Miami Dolphins, to succeed Saban. Despite not having any college head coaching experience, Schnellenberger had impressive credentials, playing end at Kentucky from 1952–1956 under legendary head coach Bear Bryant and serving as Bryant's offensive coordinator at Alabama from 1961–1965, helping the Crimson Tide win three national championships in 1961, 1964 and 1965. Schnellenberger also served as offensive coordinator for the NFL's Miami Dolphins under Don Shula, helping the team achieve an undefeated, Super Bowl-winning season in 1972. Schnellenberger served as head coach of the NFL's Baltimore Colts from 1973–1974. At the outset of his tenure, Howard Schnellenberger announced to his staff and players his intention to win a national championship within five years, a bold claim for a program that was seemingly on its last legs. His five-year plan had two main priorities: installing a pro-style passing offense and upgrading the talent level on the roster through a new recruiting strategy aimed at heavily targeting the best local talent from the city of Miami and the region of South Florida, a strategy that would drastically change national recruiting in the state of Florida in the coming years. On the recruiting front, Schnellenberger spoke of mining the "State of Miami", which entailed fencing off the fertile South Florida recruiting base from other programs and cherry-picking the rest of the nation for a few choice recruits. To help with the new pro-style offense, Schnellenberger hired former Baltimore Colts quarterback Earl Morrall as a volunteer quarterbacks coach. Schnellenberger also sought to exploit the freedom provided by Miami's independent schedule to gain "intersectional exposure" and make the program "national." On the field, Miami went 5–6 in Schnellenberger's debut season, which was highlighted by a 26–10 upset win at No. 16 Penn State in which redshirt freshman Jim Kelly threw for 280 yards and three touchdowns in his first career start as Miami's quarterback. Schnellenberger set a bowl berth as the goal of the 1980 campaign and the team made good on its head coach's expectations, winning nine games and earning a trip to the 1981 Peach Bowl, where the Hurricanes defeated Virginia Tech 20–10. The bowl berth was Miami's first since 1967 and the team finished the season ranked eighteenth in both the AP and Coaches' Polls. Miami continued to improve in 1981, going 9–2 and defeating #1 Penn State 17–14 in a late-October game at the Orange Bowl. In the season's final game, the Hurricanes topped rival Notre Dame for the first time since 1960, 37–15, finishing the season eighth in the AP Poll. The following season, the team finished with four losses following Kelly's shoulder injury. Entering the 1983 season—the fifth of Schnellenberger's tenure—the program had to find a replacement for the recently graduated Kelly. Ultimately, Schnellenberger chose Bernie Kosar as the team's starting quarterback over fellow redshirt freshman Vinny Testaverde. The 1983 Miami Hurricanes started the season unranked and lost 28–3 at Florida in their first game, though Kosar tied George Mira's single-game school record of 25 pass completions. The Hurricanes rallied by winning their next 10 games, including a 20–0 early-season shutout of Notre Dame, and earned a berth to the 1984 Orange Bowl to play the undefeated, top-ranked Nebraska team that had both Mike Rozier and Turner Gill. The Orange Bowl-berth was Miami's first since 1951, but the program's first national championship remained a long shot, as the Hurricanes entered the game ranked fifth. Miami got much needed help early on New Year's Day when second-ranked Texas, the nation's other undefeated team, lost in the Cotton Bowl Classic and fourth-ranked Illinois lost in the Rose Bowl. Behind Kosar's passing, Miami jumped out to a 17–0 lead, but Nebraska battled back and cut Miami's lead to 31–24 in the fourth quarter. With 48 seconds remaining, Nebraska scored a touchdown to make it 31–30 and, being the number one-ranked team in the nation, needed only to kick the extra point to tie the game and put itself in position to win the national championship. Nebraska head coach Tom Osborne elected to go for the win and attempt a two-point conversion instead. On the ensuing play, Miami safety Kenny Calhoun tipped away Gill's pass to receiver Jeff Smith in the end zone, saving the game and winning Miami the national championship when it leap-frogged No. 3 Auburn to finish first in the final polls. Although Schnellenberger had made good on his five-year plan to win a national championship, he left after the season to accept a head coaching position in the USFL. Two weeks later, athletic director Sam Jankovich hired Oklahoma State head coach Jimmy Johnson to fill the vacancy. One of Jimmy Johnson's immediate priorities upon taking over as Miami head coach was to switch to a 4–3 defense. Johnson wanted to implement the change for his first season, but lacking the time, personnel, and staff, he decided to postpone the switch and kept Schnellenberger's 5–2 defensive package for the 1984 season. The team struggled to an 8–5 record in Johnson's first season, losing a number of noteworthy games. In the next-to-last game of the regular season, the #6 Hurricanes squandered a 31–0 halftime lead against Maryland and lost 42–40 in what was then the biggest comeback in NCAA football history. The following week, Miami lost 47–45 when Boston College's Doug Flutie connected with Gerard Phelan for a 48-yard Hail Mary touchdown on the final play in what has been called the Hail Flutie game. The Hurricanes ended the season on a three-game losing streak by dropping the 1985 Fiesta Bowl to UCLA, 39–37, in a game that featured six lead changes. On September 22, 1984, during halftime at the Miami vs FSU game, a theater student from the University of Miami, Juan Valladares of Hialeah, Florida, threw up what is considered and documented to be the first "U" hand sign in frustration to the fact that Miami, at the time had no real identifiable and unique school identity like the FSU "CHOP" or the Florida Gator "CHOMP" hand signs. The symbolic gesture has become the de facto school symbol and is frequently used to identify the University of Miami. During the off-season, Johnson made a number of coaching changes, facilitating the switch to the 4–3 defense, and junior Vinny Testaverde succeeded early-graduate Bernie Kosar at quarterback. The 1985 team opened the season with a loss at Florida before winning their next four games, including a 38–0 win over Cincinnati that began a then NCAA-record 58 game home winning streak, heading into a matchup at No. 3 Oklahoma. Facing the nation's top-rated defense, Testaverde amassed 270 yards passing and threw touchdowns to Michael Irvin and Brian Blades, while also running for an additional score, in a 27–14 win over the Sooners. The Hurricanes ascended to number two in the rankings following a 58–7 victory over Notre Dame in the final game of the regular season, earning a trip to the Sugar Bowl to play the #8 Tennessee Volunteers. With No. 1 Penn State losing to Oklahoma in the Orange Bowl, Miami was in position to capture its second national championship, but those hopes were dashed with a lopsided 35–7 loss to Tennessee. Miami opened its 1986 season as the third-ranked team in the country and climbed to number two after winning its first three games, setting up a No. 1 vs. No. 2 showdown at the Orange Bowl against top-ranked and defending national champion Oklahoma. After much pre-game trash-talk between Oklahoma's Brian Bosworth and Miami's Melvin Bratton and Alonzo Highsmith, Testaverde tossed four touchdown passes in a 28–16 win. Testaverde's performance led Oklahoma head coach Barry Switzer to remark that he had "never seen a better quarterback" in his 21 years with the Sooners, and at the conclusion of the regular season, Testaverde was awarded the Heisman Trophy with the fifth largest margin of victory in the voting's history. 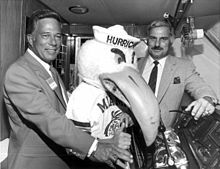 The Hurricanes, having seized the number one ranking with the win over Oklahoma, finished the regular season at 11–0, outscoring their opponents 420–136, and accepted a bid to the 1987 Fiesta Bowl to play No. 2 Penn State. There, the team's "outlaw" image grew when players like Dan Sileo was doing interviews in a Hells Angel jacket, plus arriving in Arizona clad in fatigues and Jerome Brown staged a walkout of a pre-game steak fry attended by both teams. Before an estimated television audience of seventy million people, Penn State upset the heavily favored Hurricanes 14–10 to win the national championship, forcing seven turnovers, including Pete Giftopoulus' game-sealing interception of Testaverde in the end zone in the game's final seconds. Led by Michael Irvin and new quarterback Steve Walsh, the 1987 Miami Hurricanes won the school's second national championship and completed its first undefeated varsity season. The season was highlighted by one of the most memorable games in the history of the Miami – Florida State rivalry. Trailing No. 4 Florida State 19–3 in the third quarter at Doak Campbell Stadium, the Hurricanes rallied to take a 26–19 lead late in the fourth quarter on a 73-yard touchdown pass from Walsh to Irvin. Florida State responded with a touchdown in the final minute, but Seminoles head coach Bobby Bowden opted to go for two points and the win rather than kick the extra-point for a tie, and Miami's Bubba McDowell broke up the conversion pass in the end zone to preserve the 26–25 victory. More than 60 players on the combined rosters for the game went on to play in the NFL. The 12–0 campaign was capped by a 20–14 win over the then-No. 1 Oklahoma Sooners in an Orange Bowl billed as "The Game of the Century." The win was Miami's third over Oklahoma in the last three seasons, accounting for Oklahoma's only losses during that time period. The Hurricanes had a then-school record 12 players from the 1987 team selected in the following spring's NFL Draft, including Irvin and Bennie Blades, but with Walsh returning in 1988, the team gained the number one ranking with a season-opening 31–0 shutout of then-No. 1 Florida State at the Orange Bowl. The following week, Miami scored 17 points in the final 5 minutes and 23 seconds to top No. 4 Michigan 31–30 at Michigan Stadium. Hopes of a repeat national championship were dashed, however, in the so-called "Catholics vs. Convicts" game, with Miami dropping an emotional 31–30 loss to eventual-national champion Notre Dame on a failed two-point conversion pass in the final minute. Johnson left the program in February 1989 to become the head coach of the NFL's Dallas Cowboys, ending his tenure at Miami with a 52–9 overall record and a 44–4 mark over his last four seasons. Despite having the support of students, players, and even the Miami police and fire departments, offensive coordinator Gary Stevens was bypassed for the head coaching job and athletic director Sam Jankovich chose Dennis Erickson of Washington State to succeed Jimmy Johnson instead. In 1989, Erickson became just the second Division I head coach to win a national championship in his first season at a school. Erickson's 1989 team, led by Craig Erickson (no relation) at quarterback, rebounded from a 24-10 mid-season loss at Florida State and moved back into the national championship picture with a 27–10 win over then-top-ranked Notre Dame in the final regular-season game. Miami's 33–25 win over No. 7 Alabama in the Sugar Bowl, combined with No. 1 Colorado's loss to Notre Dame in the Orange Bowl, earned the program its third national championship. Miami entered the following season as the number one team in the country, but a 28–21 upset loss to Ty Detmer and No. 16 BYU in the opener derailed both the team's national championship chances and Craig Erickson's nascent Heisman campaign. Later in the year, the Hurricanes lost to Notre Dame 29–20 in a game dubbed the "Final Conflict", as Notre Dame had decided to discontinue the 27-game rivalry, feeling the intensity of the series had reached an unhealthy level. Miami ended the season with a 46–3 Cotton Bowl Classic victory over No. 3 Texas in the 1991 Cotton Bowl Classic in which the team was penalized a bowl- and school-record 16 times for 202 yards, including nine unsportsmanlike conduct or personal foul penalties. On one play, Randal Hill scored on a 48-yard touchdown reception and continued to sprint out of the end zone and up the Cotton Bowl tunnel, where he then pretended to shoot at the Longhorns with imaginary pistols. The program was widely criticized for its conduct, with Will McDonough of the Boston Globe likening the Cotton Bowl Classic display to a "wilding" and Bill Walsh calling it "the most disgusting thing [he'd] ever seen in college sports." After the season, the NCAA responded with the so-called "Miami Rule", which made it a 15-yard penalty to engage in excessive celebration or flagrant taunting. Also during the off-season, Miami ended its 48-year status as an independent and joined the Big East Conference. The 1991 Hurricanes finished 12–0 and captured the program's fourth national championship* in nine years behind quarterback Gino Torretta and a linebacking corps that featured Jessie Armstead and Micheal Barrow. Miami's toughest test came in mid-November at then-No. 1 Florida State in the initial Wide Right game; with the #2 Hurricanes leading 17–16 in the final minute of the game, Florida State kicker Gerry Thomas' potential game-winning field goal attempt sailed "wide right" of the uprights. Miami completed the second undefeated season in school history with a 22–0 shutout of No. 11 Nebraska in the 1992 Orange Bowl and finished first in the AP Poll, splitting the national championship with Coaches' Poll champ Washington. Hurricane Andrew devastated much of South Florida in August 1992, causing the program to relocate its preseason practice sessions north to Dodgertown in Vero Beach. That season, Miami went 11–0 against the second-toughest schedule in the country, topping No. 3 Florida State in Wide Right II and No. 7 Penn State the following week in Beaver Stadium. Meanwhile, Torretta became the second Hurricane to win the Heisman Trophy, throwing for 19 touchdowns and 3,060 yards on the season and setting 11 school passing records during his career. Miami earned a trip to the 1993 Sugar Bowl, where the top-ranked Hurricanes were denied a repeat national championship by No. 2 Alabama, 34–13. The Sugar Bowl loss ended the program's 29-game winning streak, which dated to 1990. After the 1992 season, defensive coordinator Sonny Lubick left to take the head coaching position at Colorado State. The following two seasons yielded less success. In 1993, the Hurricanes lost three games in a season for the first time since 1984, failed to win the Big East for the first time since joining in 1991, and was shut out in the Fiesta Bowl by Arizona, leading some[who?] to wonder whether the program was in decline. In 1994, Miami defeated Georgia Southern in the season opener for its 58th consecutive home win, setting an NCAA record. The streak, which began in 1985, was snapped two weeks later when Washington defeated the Hurricanes 38–20 at the Orange Bowl. Led by All-American defensive tackle Warren Sapp and sophomore linebacker Ray Lewis, the team rebounded to earn a berth in the 1995 Orange Bowl, where No. 1 Nebraska outscored Miami 15–0 in the final quarter to win the game, 24–17, and the national championship. With the threat of NCAA sanctions hovering over the program for a variety of infractions, Erickson stepped down after the 1994 season to become head coach of the NFL's Seattle Seahawks. Erickson departed Miami with a 63–9 record over six seasons and the highest winning percentage (.875) and most national championships (2) of any coach in school history. Following Erickson's departure, Miami initially pursued former UM defensive coordinator and then-Colorado State head coach Sonny Lubick; however, he withdrew from consideration and opted to remain with the Rams. Eventually, Miami settled on another former Hurricanes defensive assistant coach, then-Dallas Cowboys defensive coordinator Butch Davis. The Hurricanes finished Davis's first season with a record of 8–3, which may have drawn a bowl invitation. However, on December 20, 1995, the NCAA announced that Miami would be subject to severe sanctions for numerous infractions within the athletic department. The Hurricanes were forced to sit out postseason play for the 1995 season and docked 31 scholarships from 1996 to 1998. Miami had actually self-reported the violations in 1991. However, when the Department of Education got word that school officials helped athletes fraudulently obtain Pell Grants, it asked Miami to stop its own investigation while it conducted its own. Ultimately, 60 athletes were implicated, but all of them avoided criminal charges after being sent through a pretrial diversion program. In 1994, Tony Russell, a former UM academic advisor, pleaded guilty to helping more than 80 student athletes, 57 of whom were football players, falsify Pell Grant applications in exchange for kickbacks from the players themselves. The scandal dated all the way back to 1989 and secured more than $220,000 in federal grant money. Federal officials later said that Russell had engineered "perhaps the largest centralized fraud ... ever committed" in the history of the Pell Grant program. In late 1995, the NCAA concluded that, in addition to the fraudulent Pell Grants facilitated by Russell, the university had also provided or allowed over $400,000 worth of other, improper payments to Miami football players. The NCAA also found that the university had failed to wholly implement its drug testing program, and permitted three football student-athletes to compete without being subject to the required disciplinary measures specified in the policy. The NCAA found that this was evidence that school officials didn't have adequate control over the football program. Miami docked itself seven scholarships as part of a self-imposed sanction in 1995, and the NCAA took away another 24 scholarships over the next two years. As a result of the scandal, Sports Illustrated's Alexander Wolff wrote a cover story that Miami should at least temporarily shut down its football program. Further, On June 21, 1996, Miami football players broke into the apartment of the captain of Miami's track team and struck him repeatedly. In response, Davis suspended three key players for the coming 1996 season, in which the Hurricanes finished 9–3. Davis also suspended two other players who were involved in separate violent incidents. The low point for Miami came in 1997 when they posted a 5–6 record, the first losing season since Howard Schnellenberger's first year in 1979. The 1997 season saw the Hurricanes suffer one of the program's most humiliating losses, a 47–0 beating at the hands of in-state rival Florida State. The Hurricanes began to reassert themselves in 1998, when they finished 9–3. In late September, Miami was forced to postpone their game with UCLA due to Hurricane Georges. The game was rescheduled for December 5 and for the number 2-ranked Bruins, a trip to the National Championship game was at stake. The Hurricanes rebounded from a 66–13 "caning" at the hands of Syracuse quarterback and Donovan McNabb to put up over 600 yards of total offense against UCLA en route to a stunning 49–45 victory for the Hurricanes. The following season carried high hopes and expectations for the Hurricanes. They opened the year with a 23–12 win over Ohio State in East Rutherford. Early success, however, was tempered by tough losses to Penn State and Florida State during a three-game losing streak. The Hurricanes rebounded to win their last four games including a 28–13 win over Georgia Tech in the Gator Bowl. In 2000, Miami was shut out of the BCS National Championship Game. Despite beating Florida State head-to-head and being ranked higher in both human polls, the Seminoles were chosen to challenge the Oklahoma Sooners for the national championship. The Seminoles were also chosen over Washington, who also had one loss and who had handed Miami its only loss early in the season. Washington had been ranked third or fourth in the human polls, behind Miami. The Hurricanes went into the 2001 Nokia Sugar Bowl as the Big East champions and, after much pregame antics including a brawl between members of the two teams on Bourbon Street in New Orleans, Louisiana, defeated Florida 37–20. On January 29, 2001, Butch Davis left Miami to become head coach of the NFL's Cleveland Browns. After being turned down by Wisconsin head coach Barry Alvarez, athletics director Paul Dee promoted offensive coordinator Larry Coker to head coach to replace Butch Davis. Miami started the 2001 season with a 33–7, televised win over Penn State in Beaver Stadium. Miami followed up the victory with wins over Rutgers, Pittsburgh, and Troy. After building up a 4–0 record, the Hurricanes defeated Florida State in Doak Campbell Stadium, 49–27, ending the Seminoles' 54-game home unbeaten streak. The Hurricanes then defeated West Virginia, 45–3, and Temple, 38–0, before heading to Chestnut Hill to take on Boston College. In the final minute of the fourth quarter, with Miami clinging to a 12–7 lead, Boston College quarterback Brian St. Pierre led the Eagles from their own 30-yard line all the way down to the Hurricanes' 9. With BC on the verge of a momentous upset, St. Pierre attempted a pass to receiver Ryan Read at the Miami 2-yard line. However, the ball deflected off the leg of Miami cornerback Mike Rumph, landing in the hands of defensive end Matt Walters. Walters ran ten yards with the ball before teammate Ed Reed grabbed the ball out of his hands at around the Miami 20-yard line and raced the remaining 80-yards for a touchdown, resulting in an 18–7 Miami victory. After surviving the scare from Boston College, Miami shutout #14 Syracuse, 59–0, and defeated #12 Washington, 65–7 in the Orange Bowl. The combined 124–7 score set what the Orlando Sentinel described as an NCAA-record for the largest margin of victory over consecutive ranked opponents. The final hurdle to the 2002 Rose Bowl BCS National Championship Game was at Virginia Tech. Miami jumped on Virginia Tech early, leading 20–3 at halftime, and 26–10 in the fourth quarter. But despite being outgained by the Hurricanes by 134 yards and being dominated in time-of-possession, the Hokies never quit. Virginia Tech added a couple of late touchdowns, attempting two-point conversions on each. The first conversion was successful, pulling them to 26–18, but receiver Ernest Wilford dropped a pass from quarterback Grant Noel in the endzone for the second conversion. Still, the resilient Hokies had one more chance to win the game late, taking possession of the ball at midfield and needing only a field goal to take the lead. But a diving, game-saving interception by Ed Reed sealed the Miami victory, 26–24. Defeating Virginia Tech earned the top-ranked Hurricanes an invitation to the 2002 Rose Bowl to take on BCS #2 Nebraska for the national championship. In the Rose Bowl, the Hurricanes took a 34–0 halftime lead and cruised to a 37–14 win over the Huskers to capture their fifth national championship and put the finishing touches on a perfect 12–0 season. The Miami defense shut down Heisman winner Eric Crouch and the vaunted Huskers offense, holding Nebraska 200 yards below its season average. Ken Dorsey and Andre Johnson were named Rose Bowl co-Most Valuable Players. Six Hurricane players earned All-American status and six players were finalists for national awards, including Maxwell Award winner, Ken Dorsey, and Outland Trophy winner, Bryant McKinnie. Dorsey was also a Heisman Trophy finalist, finishing third. The 2001 Miami Hurricanes are considered by some experts and historians as one of the greatest teams in college football history. Miami started the 2002 season as the defending national champion and the #1 ranked team in the country. Behind a high-powered offense led by senior quarterback Ken Dorsey, new starting running back Willis McGahee, and a stout defense anchored by Jonathan Vilma, the Hurricanes completed their regular season schedule undefeated. The season was highlighted by a 41–16 win over rival Florida at Ben Hill Griffin Stadium, the first regular season meeting between the rivals since 1987. The Hurricanes' toughest test was an October clash against rival Florida State at the Orange Bowl. Miami overcame a 13-point second half deficit to defeat the Seminoles, 28–27. The game was clinched when Florida State kicker Xavier Beitia missed a 43-yard field goal, wide left, as time expired. Another signature win came four weeks later when Miami dominated the Tennessee Volunteers, 26–3, before a crowd of 107,745 at Neyland Stadium, considered one of the most hostile road venues in college football. Miami would finish 12–0 and clinch a berth in the Fiesta Bowl BCS National Championship Game after a wild 56–45 victory over Virginia Tech in which McGahee rushed for 205 yards and a school-record six touchdowns. Both Dorsey and McGahee were named as finalists for the Heisman Trophy, finishing 4th and 5th, respectively. Miami, in the midst of a 34-game winning streak, was installed as a 13-point favorite in the Fiesta Bowl match up against #2 Ohio State. The Hurricanes took an early 7–0 lead on a 25-yard touchdown pass from Dorsey to Roscoe Parrish, but Ohio State seized control in the second quarter behind an aggressive pass rush, bolstered by constant blitzing, and a stifling rush defense. The Buckeyes held a 14–7 lead at the half, and a field goal by Mike Nugent extended Ohio State's advantage to 17–7 midway through the third quarter. A touchdown run by McGahee brought the Hurricanes within 3 points, but he suffered a knee injury early in the fourth quarter. Miami was able to fight back and force overtime on a 40-yard field goal by Todd Sievers on the final play of the fourth quarter, aided by several questionable calls. Miami scored a touchdown on its first possession in overtime on a 7-yard pass from Dorsey to Kellen Winslow II, and, on Ohio State's ensuing possession, the Hurricanes appeared to have won the game, 24–17, after Buckeyes quarterback Craig Krenzel's fourth-and-3 pass from the Miami 5 fell incomplete in the end zone. Miami players and coaches rushed the field and stadium fireworks were set off to commemorate the program's apparent sixth national championship. The celebration proved premature. At the conclusion of the play, Big 12 official Terry Porter threw a flag and made a controversial, pass interference call against Miami cornerback Glenn Sharpe. The penalty took the air out of Miami's sails and gave Ohio State new life, first-and-goal at the 1. The Buckeyes scored a touchdown to tie it at 24–24 at the end of the first overtime, and Maurice Clarett's 5-yard touchdown run in the second overtime gave Ohio State a 31–24 lead. Miami's ensuing possession saw Dorsey briefly knocked out of the game after a hit from linebacker Matt Wilhelm. After backup quarterback Derrick Crudup completed an 8-yard pass on third down, Dorsey re-entered and converted the crucial fourth-and-3 with a 7-yard completion to Winslow. Miami then drove to the Ohio State 2 yard-line, but was held to one yard on its next three plays, giving Ohio State the national championship. Miami suffered through some offensive struggles in 2003 behind new quarterback Brock Berlin. A blowout loss at Virginia Tech in early November ended Miami's 39-game regular season winning streak and a loss the following week to Tennessee ended Miami's national championship aspirations. The Hurricanes rebounded to win the Big East Conference championship and finish the season 11–2 with an 2004 Orange Bowl victory over Florida State. Miami joined the ACC in 2004 and despite 3 conference losses, the Hurricanes ended the season with a Peach Bowl victory over rival Florida. The 2005 season marked the debut of Kyle Wright as Miami's starting quarterback, although the much-ballyhooed Wright would struggle with consistency during the season with much of Miami's success that year fueled by its defense. After a loss to Florida State after placekick holder Bryan Monroe bobbled the snap for what would have been a game-tying field goal attempt, Miami would win eight straight games, including a road win over #3 Virginia Tech, only to stumble two weeks later against underdog Georgia Tech. Miami's second conference loss of the season cost it a place in the inaugural ACC Championship game and it competed instead in the Peach Bowl, where it lost to LSU, 40–3. 2005 also saw the program embroiled in more controversy when it was reported several Miami football players had recorded a rap song in 2004 that contained lewd sexual references. The song, recorded by an informal group that called itself "7th Floor Crew" and set to the beat of Aaliyah's "If Your Girl Only Knew", received much criticism in outlets such as ESPN and Sports Illustrated. Following the negative publicity, the university issued a statement condemning its lyrical content. The Hurricanes went 7–6 during a 2006 season that included an on-field brawl against Florida International, the shooting death of Miami defensive tackle Bryan Pata, and a four-game late-season losing streak. Only a Thanksgiving night victory over Boston College, in Miami's last game of the regular season, saved the Hurricanes from a losing regular season record. The day following the Boston College victory, university president Donna Shalala fired Coker. Coker coached through the postseason, where he won his final game, a 21–20 victory over Nevada on December 31, 2006, in the MPC Computers Bowl. After a search that lasted two weeks, Miami athletics director Paul Dee promoted defensive coordinator and Miami alumnus Randy Shannon to the position of the program's 22nd head coach on December 8, 2006. Shannon reportedly agreed to a four-year deal worth over $4 million. His hiring made him the first African American head coach in Miami football history. One of Shannon's first acts as head coach was to impose strict rules for the football program, enacted in large part due to the misbehavior, arrests and shenanigans of Miami players during Larry Coker's tenure as head coach. Shannon's first year as UM head coach in 2007 was one of the worst in the Hurricanes' modern history, with the team registering a losing 5–7 record. Under Shannon, the team failed to reach a bowl game for the first time in a decade, and it was the first non-penalized full-scholarship team to miss a bowl game in more than 25 years. Media draft experts considered the freshmen on the 2008 team to be one of the top recruiting classes in the nation. The 2008 season resulted in a 7–6 record. The regular season was highlighted by losses to rivals Florida and Florida State, as well as an upset victory over Virginia Tech. The 26–3 loss to Florida was Miami's first in that series since 1985, snapping a 6-game winning streak against the Gators. Afterwards, the tension between the two teams was heightened when Shannon accused Florida coach Urban Meyer of trying to run up the score with an unsuccessful deep pass into the end zone in the game's final minute. The visiting Hurricanes were 22½ point underdogs in the nationally televised game but only trailed 9–3 heading into the fourth quarter, leading some to wonder whether Meyer was trying to compensate for his team's unimpressive performance before kicking a field goal with :25 remaining." Miami was knocked out of ACC Championship contention with a late-season loss to Georgia Tech in which the Hurricanes surrendered the second-most rushing yards in school history (472). The Hurricanes finished the 2008 season with a 24–17 loss to California in the Emerald Bowl. After the 2008 season, Shannon fired offensive coordinator Patrick Nix, citing philosophical differences. Also, starting quarterback Robert Marve left the team because he claimed not to be able to play for Coach Shannon. Shannon placed strict restrictions on Marve's potential transfer destinations and received much criticism in the media. However, the University of Miami claimed in a press release that the restrictions were set because of suspected tampering by Marve's family or others on behalf of the Marve family. Shannon's staff suffered more upheaval when defensive coordinator Bill Young left to assume the same position at Oklahoma State, his alma mater, in late January 2009. North Carolina assistant John Lovett was hired to replace him. Shannon hired former UMass head coach Mark Whipple as Miami's new offensive coordinator and associate head coach. Several Miami offensive players from the 2008 season returned, including quarterback Jacory Harris, both starting running backs, most of the offensive line and its top six receivers. Shannon has been able to recruit a number of Southern Florida's top high school football players by telling them that they would be able to play immediately. In fact, 21 true freshmen played during the 2008 season opener. The 2009 season began on a poor note after two back up quarterbacks, Taylor Cook and Cannon Smith both transferred out during fall practice, leaving the young Hurricane team with only one serviceable backup in true freshman A.J. Highsmith. Sophomore Jacory Harris directed the newly implemented offense. To make matters worse, starting defensive end Adewale Ojomo suffered a broken jaw in a locker room fight that led to a season-ending injury, causing the already young Hurricane team to go into their season short handed. Miami faced a difficult schedule to start the 2009 season with visits to #18 Florida State, a home game against #15 Georgia Tech, a visit to Lane Stadium and the #7 Virginia Tech Hokies and a home visit from the defending Big 12 Conference champions and BCS Champion runners-up in #3 Oklahoma. Some national media outlets and sites such as ESPN predicted at best a 2–2 record for the Hurricanes with some even predicting an 0–4 start. Miami opened up their 2009 season against Florida State on Labor Day night for a national broadcast for ESPN. Billed as a "Battle of Rebuilding Programs", Quarterback Jacory Harris led a heroic comeback in Tallahassee to beat the then ranked Seminoles 38–34, overcoming a late interception and apparent injury to Harris in the 4th quarter. The next week, Miami welcomed the triple option offense of the #14 Georgia Tech Yellow Jackets in yet another ESPN prime-time game. Georgia Tech came in hot off of a big ACC win against Clemson University the previous week and held a 4–0 record against the Hurricanes in the last 4 years, including the previous years pounding in Atlanta (referenced above). The 2009 contest would be a different story all together, as the Hurricanes handily beat the Jackets 33–17 at home and allowed only 95 rushing yards in the process. The next week, with the Hurricanes in the national spotlight for the first time in 5 years, the #9 Miami team visited the #11 Virginia Tech Hokies. In pouring rain, Tech defeated the Hurricanes by a final score of 31–7. Beat up and embarrassed, Miami then played Oklahoma. Without Heisman Award winner Sam Bradford, Oklahoma took an early 10–0 lead after two early Jacory Harris interceptions. Going into halftime, the Hurricanes trailed the Sooners 10–7 in a highly contested football game. Miami came out for the second with a huge hit on the kick off team by Cory Nelms that forced the Sooners to start inside their own 20. The following play, Sophomore Corner Brandon Harris hit Oklahoma Quarterback Landry Jones and forced a fumble that eventually led to a Hurricane touchdown. The momentum stayed with the Hurricanes as they rode to a 21–20 win over the #8 team in the country. Following the opening four weeks, Miami was 3–1 and was the talk of sports stations nationwide. Following the gauntlet first third of the season, the Hurricanes won against Florida A&M at home and on the road against in-state foe UCF, moving all the way up to #10 in the polls. The Canes then had to take on Clemson in Miami, Florida, in what was a contest of speed and athleticism. Turnovers, missed opportunities and stand-out back C. J. Spiller led the Tigers to a 40–37 overtime win against the Hurricanes, knocking them out of BCS contention and putting the ACC Championship Game in serious jeopardy. A win against Wake Forest on Halloween kept the Hurricanes in the conference race, which they followed up on with a 52–17 defeat of Virginia in Miami. The next week North Carolina, led by former Miami head coach Butch Davis, topped Miami 33–24 with an unimpressive performance by Jacory Harris and the offense. Miami finished up the 2009 regular season with back-to-back wins over Duke and in-state opponent South Florida. Miami's final record was 9–3, finishing in 3rd place for the ACC Coastal Division behind Georgia Tech and Virginia Tech. The announcement of the 2009 bowl selections stirred some controversy. Instead of choosing the 3rd best team in the ACC (Miami), Gator Bowl officials chose Florida State to represent the ACC against West Virginia instead of the Hurricanes because of the retirement of legendary FSU coach Bobby Bowden, who served as West Virginia's head coach from 1970–1975. The Hurricanes were relegated to the 2009 Champs Sports Bowl in Orlando, Florida, to play against the 9–3 Wisconsin Badgers. Though the Hurricanes were heavy favorites coming into the contest, the Badgers beat up on the Hurricanes consistently throughout the game. The Hurricanes started off fast with a big return to open the game by Sam Shields, but the Canes just could not maintain any offense throughout the game and had no answer for the power offense of Wisconsin. Going into halftime, the Hurricanes trailed 17–7 and Graig Cooper blew out his knee on the poor turf just before halftime on a kick off return. Though Miami scored a late touchdown and recovered the onside kick, they fell to Wisconsin 20–14 and finished the season at 9–4. After the 2009 season, Shannon signed the #13 recruiting class in the nation according to ESPN. Shannon addressed many depth issues including offensive line, line backers and running backs, however the media claimed that the staff missed out on several of the more highly touted recruits on signing day, including a couple of "5 star" players. Coaching changes were made before and after signing day, including the departure of defensive line coach/recruiting coordinator Clint Hurtt to the Louisville and the loss of running backs coach Tommie Robinson to the Arizona Cardinals. Shannon replaced them with former Hurricane and current Kentucky defensive line coach Rick Petri as well as running back coach Mike Cassano from Florida International University. Subsequently, Shannon named wide-receiver coach Aubry Hill as the recruiting coordinator for the program. In May 2010, the university raised Randy Shannon's pay and extended Shannon's contract as head coach through 2014. The Hurricanes finished the 2010 season with a 7–6 record which included losses to rivals Florida State and Virginia Tech as well as their first ever loss to in-state opponent South Florida in the last game of the season. Shannon was fired by athletics director Kirby Hocutt after the loss to South Florida. Interim head coach Jeff Stoutland, who was offensive line coach under Shannon, led the team into its 2010 Sun Bowl matchup versus Notre Dame; the Hurricanes lost the New Year's Eve game 33–17. On December 13, 2010, it was announced that athletics director Kirby Hocutt hired Temple head coach Al Golden as the program's 23rd head coach. Golden was regarded as an up-and-coming coach who had turned around an abysmal Temple football program. Shortly after announcing Golden's hiring, Miami signed Golden to a five-year contract. In 2011, Golden's first season, the Hurricanes posted a 6–6 record. It was only the third time, since 1979, that the program had failed to register a winning record. The Hurricanes kicked off the season with a 32-24 loss to Maryland. After upsetting #17 Ohio State, the Hurricanes lost to Kansas State by a margin of 28-24. Golden's team defeated in-state FCS foe Bethune-Cookman on October 1 by a score of 45-14. After a close 38-35 loss to Virginia Tech, Miami defeated North Carolina by a score of 30-24 and #20 Georgia Tech by a score of 24-7. The Hurricanes alternated between win and loss for the remainder of the season; losing to Virginia 28-21, defeating Duke 49-14, losing to archrival Florida State 23-19 beating South Florida in a 6-3 defensive struggle and losing to Boston College by a score of 24-17. On November 25, 2011, Miami signed Golden to a raise and four-year contract extension through the 2019 season. In 2012, the Hurricanes finished with a 7–5 mark. They started the season with a 41-32 victory over Boston College on September 1. After a 52-13 blowout loss to Kansas State, Golden's team won their next three; defeating Bethune-Cookman 38-10, Georgia Tech 42-36 and NC State 44-37. Next, however, the Hurricanes lost their next three; dropping a 41-3 blowout to #9 Notre Dame, an 18-14 struggle to North Carolina, and a 33-20 loss to #12 Florida State. On November 1, Miami defeated Virginia Tech by a score of 30-12. After a heartbreaking 41-40 loss to Virginia, the Hurricanes won their last two; dominating South Florida 40-9 and outlasting Duke by a score of 52-45. This resulted in a three-way tie, with North Carolina and Georgia Tech, for the best record in the ACC Coastal Division. North Carolina, which had defeated the Hurricanes earlier in the season, would have been declared the coastal division champion based on the ACC tie breaker formula. However, due to NCAA sanctions, they were ineligible for postseason play. Miami finished in second place based on the formula. However, due to likely pending NCAA sanctions from the Nevin Shapiro scandal, the university's administration preemptively chose to forego post-season play for the second consecutive year. Had they played, it would have marked their only appearance in the ACC championship game, since joining the conference, in 2004. It would also have set up a rematch with Florida State, who had defeated the Hurricanes earlier in the season. The Hurricanes compiled a 9–4 record in 2013. Golden's team came storming out of the gate, winning their first seven; a 34-6 win over in-state opponent Florida Atlantic, a 21-16 win over rival Florida, a 77-7 thrashing of FCS opponent Savannah State, a 49-21 victory over South Florida, a 45-30 win over Georgia Tech, a 27-23 close win over North Carolina and a 24-21 nail biter over Wake Forest. The Hurricanes suffered their first loss of the 2013 season on November 2, losing to #3 Florida State in a 41-14 thrashing. Miami dropped a second straight game by way of a 42-24 loss to Virginia Tech and a third consecutive loss to Duke in a 48-30 disappointment dropped the Hurricanes from a #7 national ranking to unranked in those three weeks. The Hurricanes were able to close out the regular season with two wins, defeating Virginia 45-26 and Pittsburgh 41-31. Miami received a berth in the 2013 Russell Athletic Bowl, a game they lost to #18 Louisville in a 36-9 blowout. In October 2013, after an investigation spanning two and a half years, the NCAA announced that "the committee acknowledged and accepted the extensive and significant self-imposed penalties by the university." Therefore, no further bowl ban would be enforced. As a result, Miami was eligible to compete in ACC championship and BCS bowls for the 2013–14 season. However, the NCAA stripped Miami of nine scholarships over three years. The Hurricanes went 6–7 in 2014. Miami kicked off the season with a 31-13 loss to #25 Louisville on September 1. Miami defeated Florida A&M 41-7 and Arkansas State 41-20 over the next two weeks before losing to #24 Nebraska by a score of 41-31. On September 27, the Hurricanes defeated Duke by a margin of 22-10. On October 4, Georgia Tech defeated Miami by a score of 28-17. Miami won their next three; winning 55-34 over Cincinnati, 30-6 over Virginia Tech and 47-20 over North Carolina. Golden's squad struggled to finish the season, losing their last four; a 30-26 letdown to archrival Florida State, a 30-13 disappointment to Virginia, a 35-23 defeat at the hands of Pittsburgh in the regular season finale and a 24-21 close defeat in the 2014 Independence Bowl in Shreveport, Louisiana, to South Carolina. The Hurricanes finished 8–5 in 2015. By this time, many Miami fans had grown restless and irritated at the team's inconsistencies and began to call for Golden to be fired using different means, including flying airplanes over Hard Rock Stadium with various "Fire Al Golden" banners. The Hurricanes started the season with a 45-0 shutout of Bethune-Cookman on September 5. A 44-20 win over Florida Atlantic and a 36-33 overtime victory over Nebraska followed before the Hurricanes lost 34-23 to Cincinnati and 29-24 to #12 Florida State. Miami defeated Virginia Tech by a score of 30-20 on October 17 in what would be Al Golden's last win as Miami head coach. On October 25, 2015, the day after a 58-0 home loss to Clemson, the worst defeat in school history, the university's athletic director, Blake James, announced Golden had been fired. Golden was 32–25 in his five seasons at Miami and led the program to bowl games in 2013 and 2014. Tight ends coach Larry Scott finished the season as interim head coach. In Scott's first game as interim head coach, the Hurricanes recorded a controversial win over Duke. The Hurricanes used eight laterals (reminiscent of the 1982 Cal-Stanford ending) on a kickoff return with no time remaining to score the game-winning touchdown and stun the Blue Devils by a score of 30-27. However, video evidence showed the play should have been blown dead and not counted as a touchdown, as Miami players who possessed the ball on that play's knee were shown to be on the ground more than once. Although the outcome of the game couldn't be changed, the Atlantic Coast Conference subsequently suspended the game and replay officials for failing to catch the errors and make the correct call. On November 7, Miami defeated Virginia by a score of 27-21. The next week, the Hurricanes lost to #17 North Carolina by a score of 59-21. Miami then defeated Georgia Tech 38-21 and Pittsburgh 29-24. The Hurricanes received a berth in the 2015 Sun Bowl, a game they lost to Washington State by a score of 20-14. On December 4, 2015, former Georgia head coach Mark Richt was named Miami's 24th head football coach. The hiring generated much excitement and was well-received and praised all across the country. Although he had recently been fired as head coach of the Bulldogs, Richt achieved great successes during his fifteen years as Georgia head coach. His teams represented the SEC in three BCS bowl appearances with a record of 2–1, and finished in the top ten of the final AP Poll seven times (2002–2005, 2007, 2012, 2014). His 2008 team also finished in the top ten of the coaches poll. His Georgia teams averaged about nine wins per season, won two Southeastern Conference championship games and reached four more, reached bowl games each of his fifteen seasons as head coach and sent many players to National Football League playing careers. 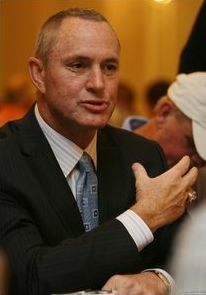 Richt had prior ties to the Miami football program, having played quarterback for the Hurricanes under Lou Saban and Howard Schnellenberger from 1978–1982 and, despite being behind the likes of Jim Kelly, Vinny Testaverde and Bernie Kosar on the depth chart, amassed nearly 1,500 passing yards during his college playing career. Richt also served as offensive coordinator at Florida State from 1994–2000 under Bobby Bowden, overseeing an offense that was one of the most potent in the country, won two national championships, and produced two Heisman Trophy winners in Charlie Ward and Chris Weinke. Miami signed Richt to a five-year contract worth $4.1 million annually. The Hurricanes improved to 9–4 in 2016. They began the season on September 3 by blowing out in-state FCS opponent Florida A&M 70-3. The next week, the Hurricanes defeated Florida Atlantic by a score of 38-10. After defeating Appalachian State 45-10, Miami defeated Georgia Tech by a score of 35-21 to record their first Atlantic Coast Conference win under Richt. Then, the Hurricanes embarked upon a four-game losing streak, dropping games to #23 Florida State by a score of 20-19, North Carolina by a margin of 20-13, Virginia Tech by a count of 37-16 and Notre Dame to the tune of 30-27. The Hurricanes rebounded to win their last five games of the season; a 51-28 trouncing of Pittsburgh, a 34-14 victory over Virginia, a 27-13 win over NC State and a 40-21 win over Duke with quarterback Brad Kaaya becoming Miami's all-time leading passer to close the regular season. On December 28, 2016, Richt led the Hurricanes to their first bowl win in 10 years, when they defeated #16 West Virginia in the 2016 Russell Athletic Bowl by a score of 31-14. Miami finished 10–3 in 2017. The Hurricanes began the season on September 2, defeating in-state FCS opponent Bethune–Cookman by a margin of 41-13. The Hurricanes were supposed to play Arkansas State on September 9, but the game was cancelled due to Hurricane Irma battering the state of Florida that weekend. Although the game was to be played in Jonesboro, Arkansas, the University of Miami administration contended that it would be too difficult for the football team to safely travel in and out of Florida due to the intensity of the hurricane. When Miami refused to reschedule the game and pay the $650,000 they agreed to pay the Red Wolves, the Arkansas State University administration filed a lawsuit seeking the payment. As a result of the cancellation, Miami only played 11 regular season games in 2017 as opposed to the usual 12. Miami also rescheduled their game against Florida State from September 16 to October 7 due to the aftermath of the hurricane. On September 23, Miami played its second game of the season, defeating Toledo by a score of 52-30. After a 31-6 victory over Duke, Richt's team defeated archrival Florida State by a score of 24-20. After a 25-24 nail biting win over Georgia Tech, the Hurricanes defeated Syracuse by a margin of 27-19. On October 28, Miami defeated North Carolina by a score of 24-19. That was followed by a 28-10 victory over #13 Virginia Tech. On November 11, Richt's squad obliterated Notre Dame by a score of 41-8. After a 44-28 win over Virginia, Miami suffered its first loss of the season in the regular season finale, falling to Pittsburgh by a margin of 24-14. In the 2017 ACC Championship Game, Miami was obliterated by #1 Clemson by a score of 38-3. The Hurricanes accepted a berth in the 2017 Orange Bowl, a game they lost to #6 Wisconsin by a score of 34-24. On May 3, 2018, the University of Miami administration signed Richt to a five-year contract extension. Miami finished 7-6 in 2018 and ended the season with another loss to Wisconsin in the Pinstripe Bowl 35-3. On December 30, 2018, Richt abruptly announced his retirement from coaching. On the same day Richt announced his retirement, Miami hired Manny Diaz as their new head coach. Diaz, a Miami native, had served as the team's defensive coordinator the past 3 seasons and was hired as head coach by Temple 17 days prior to Richt's retirement. Miami has won nine national championships from NCAA-designated major selectors. Miami claims the 1983, 1987, 1989, 1991, and 2001 national championships. Miami has won nine conference championships, six outright and three shared. Miami has one division championship in the ACC Coastal Division. Miami has played in 40 bowl games, going 19–21. Its most common bowl destination has been the Orange Bowl, where the 'Canes have appeared 9 times and compiled a 6–3 record. Miami's most common opponent in bowl play has been Nebraska. The schools have met six times in bowl play, with the Hurricanes having a 4–2 record against the Cornhuskers. Miami's traditional rivals are Florida State and Florida. Since 2002, the Florida Cup has been awarded to the team that finishes with the best head-to-head record in years where Miami, Florida, and Florida State all face each other. Five Florida Cups have been awarded, with Miami winning the first three. The Florida State rivalry dates to 1951, when the Hurricanes defeated the Seminoles 35–13 in their inaugural meeting. The schools have played every year since 1966, with Miami holding the all-time advantage, 33–30. Upon the conclusion of their 2003 regular-season schedules, the teams represented their respective conferences in the 2004 FedEx Orange Bowl (Miami being the champions of the Big East, and Florida State being the champions of the ACC). Miami won the bowl game 16–14; it was the only time the schools have met in post-season football play. The 63 meetings between the teams of FSU and Miami eclipsed the rivalry between the Hurricanes and the Gators (from the University of Florida) following their 2010 game; the series of games between UM and Florida is Miami's second-longest at 55 games. During the 1980s and '90s, the series emerged as one of the premier rivalries in college football. Between 1983 and 2002, the Hurricanes and Seminoles combined to win 7 national championships and play in 14 bowl games with a national championship at stake. The 1988 game starred 57 future NFL pros on the combined rosters. Since 2004, the year Miami left the Big East Conference to join the expanded 12-member Atlantic Coast Conference, the universities have been conference foes, though they are placed in separate divisions within the conference. This alignment creates the potential for the two teams to meet for a second time in the ACC Championship Game, should each win their respective divisions in any particular season. Such a rematch has yet to happen after 14 years of ACC Championship Games, as of 2018. The series has consistently drawn very high television ratings with the 2006 Miami–Florida State game being the most-watched college football game—regular-season or postseason—in ESPN history, and the 2009 and 1994 meetings being the second- and fifth-most watched regular season games, respectively. The Miami Hurricanes lead the all-time series 33-30. The most recent meeting was in 2018 on October 6 when the Miami Hurricanes won 28-27. Miami's rivalry with Florida dates back to 1938, making it the oldest rivalry among Florida's "Big Three" of Miami, Florida, and Florida State. The Hurricanes defeated the Gators, 19–7, in the first meeting between the geographic rivals. The Seminole War Canoe was carved in 1955 out of a cypress struck by lightning and was given to the winner of the annual football game. The canoe is meant to symbolize the fighting spirit of the Seminole people that is often on display during games between the Hurricanes and Gators. The canoe is now on permanent display at the University of Miami Sports Hall of Fame on the Coral Gables campus. Miami holds the edge in the all-time series with a 29–26 record against Florida. The two schools met every year from 1944 until 1987, but have not played regularly since then. Florida canceled the annual series after the 1987 season, when the requirement of the Southeastern Conference for member schools to play eight conference games induced the University of Florida to fill out the non-conference portion of its schedule with teams that do not require a home-and-home arrangement, except for Florida State. From 1986 to 2003, Miami won all six of the games between the schools, including victories in the 2001 Sugar Bowl and the 2004 Peach Bowl. Florida snapped its 23-year drought against Miami with a 26–3 win over the Hurricanes in 2008. The last game between the two was September 7, 2013 at Sun Life Stadium, Miami won 21-16. The two teams are slated to meet again during the opening weekend of the 2019 college football season at the Camping World Kickoff in Orlando, Florida. The Hurricanes and Hokies first met on November 13, 1953, in Miami. Miami and Virginia Tech have met in two bowl games: the 1966 Liberty Bowl and 1981 Peach Bowl. The two teams have played annually since 1992, and the rivalry developed when the Hokies became a member of the Big East Conference for football in 1991. When the Atlantic Coast Conference (ACC) expanded in 2004, both Miami and Virginia Tech became members of the ACC. Both teams continue to compete annually as part of the ACC's Coastal Division. The series was one-sided until 1995 when Virginia Tech took their first game against Miami in Blacksburg. Beginning in that year, the series has been in favor of Virginia Tech, 14–8. There have been several notable games in this time, including 11 meetings in which both teams were ranked in the top 25 and four meetings where both teams were in the top 10. The series with Nebraska is tied at 6–6 as of 2018. The Hard Rock Stadium plays host to the Hurricanes football team during their regular season. The stadium is located in Miami Gardens, Florida, located approximately 22 mi (35 km) north of the UM's main Coral Gables campus. Hard Rock stadium is the home stadium of the Miami Dolphins of the National Football League(NFL). From 1937 through 2007, the team played its home games at the Orange Bowl, located in the Little Havana section of Miami. In the late 2000s, the City of Miami, the owner of the Orange Bowl, proposed to extensively renovate it. However, those plans fell by the wayside as the city focused on keeping the Marlins baseball team in town, forcing the university to threaten a move to Hard Rock Stadium if a plan to renovate the stadium was not in place within 45 days. When the city could not deliver on a renovation plan, the university's board of trustees, on the recommendation of UM President Donna Shalala, approved the shift to Hard Rock Stadium on August 21, 2007. At its inception, the program played at Tamiami Park and, later, Moore Park before moving to the then Burdine Stadium in 1937. The Paul J. DiMare Gallery of Champions, which showcases individual and team titles, such as UM’s five national championships in football, as well as awards like the Heisman Trophies won by former Hurricanes Gino Torretta and Vinny Testaverde. A football locker room made possible by a gift from Dwayne “The Rock” Johnson, who played at UM before his successful wrestling and Hollywood acting careers. An academic center with new computers, study rooms, and the 140-seat Robert & Lauren Mann Auditorium. An expansion of the existing Isadore Hecht Athletic Center to include a state-of-the-art sports medicine and training area. In May 2017, the university broke ground on the new Carol Soffer Indoor Practice Facility. The $34 million facility was led by a $14 million gift from Miami billionaire Jeffrey Soffer, owner of the famed Fountainebleau Miami Beach. The building exceeds 100,000 square feet and includes two turf fields that combine for 81,000-square feet. The indoor facility, located on the current football practice area, will also house a football operations center with a mezzanine level for the football coaches' offices and meeting rooms. Miami also has two of the longest winning streaks in NCAA Division I history. From 2000 to 2003, Miami won 34 consecutive games, tying for sixth all-time. The streak started on September 23, 2000, with a 47–10 victory at West Virginia and ended on January 3, 2003, with a 31–24 double overtime loss to Ohio State in the 2003 Fiesta Bowl. Miami also won 29 straight games from October 27, 1990, to January 1, 1993, good for thirteenth on the all-time list. That streak was snapped when the top-ranked Hurricanes were upset by second-ranked Alabama, 34–13 in the 1993 Sugar Bowl. Miami owns the record for the longest home winning streak in NCAA history, winning 58 straight games at the Orange Bowl. The record streak began with a 38–0 shutout victory over Cincinnati on October 12, 1985, and ended with a 38–20 loss to Washington on September 24, 1994. The 58 game streak includes three Orange Bowl victories where Miami was the away team because of the Orange Bowl's tie to the Big 8 conference. In addition to its own lengthy winning streaks, Miami has snapped four streaks of 20 games or more in its history. The only other school to snap four winning streaks of 20 or more games is Princeton. In the 1984 Orange Bowl, Miami ended top-ranked Nebraska's 22-game winning streak and won its first national championship with a 31–30 victory. The Hurricanes halted top-ranked Oklahoma's 20-game streak and won their second national championship when they defeated the Sooners, 20–14, in the 1988 Orange Bowl. The Hurricanes ended top-ranked Notre Dame's 23-game winning streak with a 27–10 win on November 25, 1989. Miami also ended the 20-game winning streak of UCLA when Miami defeated the third-ranked Bruins 49–45 on December 5, 1998. The following twelve Miami players and coaches have been or will be inducted to the College Football Hall of Fame. Eight former players have been inducted into the Professional Football Hall of Fame. Touchdown Tommy is the cannon that is fired off when the team runs out of the tunnel, after every point that the Hurricanes score, and the conclusion of a victory. The cannon is kept by the Sigma Chi fraternity's Cannon Master and fired off during the games by the senior brothers of Sigma Chi. Touchdown Tommy is the third oldest tradition at the University of Miami, after the Iron Arrow Honor Society and Sebastian the Ibis. One of the Hurricanes' best-known traditions is the team's entrance scene. The team enters the field through a large cloud of white smoke billowing from its entrance tunnel, amid a tape of a hurricane blasting over the sound system. The smoke comes from fire extinguisher exhaust that billows from a series of pipes welded together by school transportation director Bob Nalette in the 1950s. The pipes were moved to Sun Life Stadium when the Hurricanes moved there in 2008. Following Miami's rise to prominence in the 1980s, many high school, college and NFL teams over the last 25 years have copied this practice, and in 2001 ABC made a parody of it for a Saturday college football commercial. In 1997, the university established the 'Ring of Honor' as a way to honor outstanding players who have passed through the Hurricane football program. Members are selected by an anonymous advisory committee, the director of athletics and the head football coach. The names and jersey numbers of the inductees were displayed on the upper deck of the Orange Bowl (which has since been torn down). The inaugural class of included Jim Dooley, Ted Hendricks, George Mira, and Vinny Testaverde. These four players are the only ones in the history of the program to have their numbers retired by the university as well. Vinny Testaverde's number was taken out of retirement for the 2015–2016 football season, at Testaverde's behest. His son currently wears #14. A second group of players consisting of Ottis Anderson, Don Bosseler, Bernie Kosar, and Burgess Owens was inducted in 1999. After a nine-year hiatus, five new players were added in 2008: Pro Football Hall of Famers Jim Kelly and Jim Otto, former Heisman Trophy-winner Gino Torretta, running back Edgerrin James, and defensive lineman Cortez Kennedy. In 2009, College Football Hall of Fame defensive back Bennie Blades, running back and former Miami head coach Eddie Dunn, and quarterback Steve Walsh were inducted. In 2017, the Miami Hurricanes began to award its "Turnover Chain," an honor that contains a 36-inch, 2.5-kilogram, 10-karat gold chain, with 900 orange and green sapphire stones arranged in a "U" that is 6.5 inches wide. It is presented during a game to any defensive player who forces a turnover. Through the 11 regular-season games Miami played in 2017, the Hurricanes' defense created 29 turnovers (17 passes intercepted, 12 fumbles recovered), the third most in FBS football. During the same period, Miami gave up 12 turnovers (throwing 9 interceptions, and losing 3 fumbles); the net gain of 17 turnovers resulted in a margin of +1.55 per game. That figure represents the greatest margin in the nation this year, an achievement shared with Central Florida. Many Miami players go on to play in the National Football League. The school holds multiple NFL draft related records: most first-round draft picks in a two-year period (11, 2003–2004); most first-round draft picks in a three-year period (15, 2002–2004); and most first-round picks in a four-year period (19, 2001–2004). From 1995 through 2008, Miami set an NFL Draft record by having at least one player selected in the first round of 14 consecutive drafts. The Hurricanes once had a streak of 149 consecutive regular season weeks where a former Hurricane scored a touchdown in an NFL game; the streak started in Week 15 of the 2002 NFL regular season and ended in Week 11 of the 2011 season. During the streak, 33 different former Hurricanes scored touchdowns and a total of 661 touchdowns were scored. Setting a new record for most players from one school, eleven former Hurricanes were selected to the 2010 Pro Bowl, which happened to take place at Miami's Sun Life Stadium. The University of Miami has also experienced some degree of controversies, scandals and incidents which at times have led to NCAA sanctions, suspensions, and negative publicity for the university. These include a situation in 1978 where three players threw a man into a lake precipitating the resignation of coach Lou Saban, the 1991 Cotton Bowl Classic unsportsmanlike conduct giving rise to the so-called "Miami Rule", the 1995 Pell Grant scandal, and the 2005 "7th Floor Crew" rap song, described above. 2 Live Crew member Luther Campbell was alleged to have been behind what was referred to as a "pay-for-play" system, which involved cash rewards for acts such as scoring touchdowns and big hits, although Campbell has never donated directly to the University of Miami or its athletics department. On October 14, 2006, in the first meeting of cross-town programs, Miami and the Florida International Golden Panthers brawled after a PAT. FIU cornerback Chris Smith wrestled Miami holder Matt Perelli to the ground after the kick and appeared to punch him in the chin. Another FIU cornerback, Marshall McDuffie, Jr., kicked Perelli in the head. Miami's Anthony Reddick swung his helmet at FIU players and Miami's Brandon Meriweather kicked an FIU player. FIU's A'Mod Ned, who was injured, came onto the field and swung at Miami players with his crutches. The fight lasted just over one minute before the coaches of both teams were able to separate the players. Florida Highway Patrol state troopers and City of Miami police arrived on the field as the fight was going on and remained a visual presence on the sidelines and in the stands to prevent further fighting. The game was delayed approximately 15 to 20 minutes as the officials attempted to sort out which players were ejected and what, if any, penalty yards needed to be enforced. The next day, 31 players from both schools were punished–18 from FIU, 13 from Miami; the Miami players were handed one-game suspensions, while the FIU players were suspended for the remainder of the season. Three Miami players were suspended indefinitely and the rest were also assigned community service work. A Ponzi schemer, convicted felon and former Miami booster, Nevin Shapiro, claimed he used investor funds to finance donations to the University of Miami's athletic program and gave an estimated $2 million in illegal benefits to at least 72 current or former football and basketball players and coaches from 2002–2010. A Yahoo! Sports report alleged that Shapiro, through his donations, violated at least four major NCAA bylaws. During the investigation of the allegations, the university self-imposed a ban on bowl participation. In October 2013, the NCAA announced that the university would lose three football scholarships in each of the next three seasons, but there would be no further bowl ban. The university became eligible again for bowl participation as of the 2013–14 season. In 2009, Miami-based media studio Rakontur released a documentary film called The U, as part of ESPN's 30 for 30 film series. The film depicts the rise of the University of Miami's football tradition throughout the 1980s and early 1990s. According to the filmmaker, the university chose not to be involved in the project, and denied access to coach Randy Shannon, Paul Dee and Tad Foote, the former president of the university. The film features the rise of the UM football program in the 1980s, but also includes details related to player crime and drug usage and privileges provided to players, including Luther Campbell's "pay for play", in which the rap star reportedly paid UM players for major hits and plays. The film addresses the controversial and pioneering nature of the UM football program. The film was pre-screened on campus on December 10, 2009, with only two student athletes attending and televised two days later on ESPN. The U Part 2 was also created to depict the rise and once again fall of their football program. Announced schedules as of February 19, 2018. The ACC plays an eight-game conference schedule, with four non-conference games to schedule a year. This is Miami's future scheduled non-conference opponents, subject to change. (P5) Is to denote if a schools is a Power 5 Conference/Notre Dame opponent, which starting in 2017 the ACC will require members to play. ^ University of Miami Visual Identity Manual (PDF). April 9, 2015. Retrieved December 10, 2017. ^ "Songs & Cheers". Miami Hurricanes. April 3, 2013. Archived from the original on September 23, 2015. Retrieved September 23, 2015. ^ Jones Jr., Robert C. (2007). "Born and Bred". Miami: The University of Miami Magazine. Archived from the original on August 16, 2010. Retrieved October 17, 2009. ^ "Football Bowl Subdivision Records" (PDF). NCAA. p. 117. Retrieved January 30, 2016. ^ a b c d e f Battista, Judy (April 11, 2009). "Miami Hurricanes' First-Round N.F.L. Draft Streak Nears a Likely End". The New York Times. Retrieved July 14, 2009. ^ a b "Miami Names Manny Diaz Head Coach After Mark Richt Steps Down". www.si.com. Retrieved December 30, 2018. ^ "University of Miami Hurricanes Official Athletic Site". www.HurricaneSports.com. Retrieved November 2, 2017. ^ a b c d e f g h i j k l m n o p q r s t u v w x y z 2007 University of Miami Football Media Guide. 2007. pp. ??. Archived from the original on October 26, 2008. Retrieved October 13, 2009. ^ Howell, Brian (January 1, 2013). "Miami Hurricanes". ABDO Publishing Company. Retrieved November 2, 2017 – via Google Books. ^ a b c d e f "2008 UM Football Media Guide" (PDF). p. 158. Retrieved November 24, 2009. ^ "Team Name and Logo". HurricaneSports.com University website. Archived from the original on December 8, 2009. Retrieved October 13, 2009. ^ "@MiamiHurricanes Football History". hurricanesports.com. Retrieved November 2, 2017. ^ "Hurricanes Football: Year-by-Year Records". hurricanesports.com. Retrieved November 2, 2017. ^ Martz, Jim. "Material from the book "Hurricane Watch"". Archived from the original on September 1, 2009. Retrieved October 14, 2009. ^ "Miami Daily News-Record from Miami, Oklahoma on November 25, 1929 · Page 5". newspapers.com. Retrieved November 2, 2017. ^ "Powered by Google Docs". Docs.google.com. Retrieved July 19, 2012. ^ Smith, Craig T. (September 2, 2014). "Game of My Life Miami Hurricanes: Memorable Stories of Hurricanes Football". Skyhorse Publishing, Inc. Retrieved November 2, 2017 – via Google Books. ^ "University of Miami Legacy Images". Archived from the original on June 12, 2010. Retrieved November 28, 2009. ^ "2008 UM Football Media Guide" (PDF). p. 165. Retrieved November 24, 2009. ^ Fisher, Scott M. (July 21, 2003). "The Ironmen". Xlibris Corporation. Retrieved November 2, 2017 – via Google Books. ^ "1938 Miami (FL) Hurricanes Schedule and Results - College Football at Sports-Reference.com". College Football at Sports-Reference.com. Retrieved November 2, 2017. ^ Gumm, Jim (August 17, 2017). "Conference Pride: The Ultimate Book about SEC Football from 1933-2016". Dorrance Publishing. Retrieved November 2, 2017 – via Google Books. ^ "Reviving college football's dead conferences". sbnation.com. Retrieved November 2, 2017. ^ "Eddie Dunn - University of Miami Sports Hall of Fame". UM Sports Hall of Fame. Retrieved November 2, 2017. ^ "Hurricanes Football: Year-by-Year Results". hurricanesports.com. Retrieved November 2, 2017. ^ "1944 Miami (FL) Hurricanes Schedule and Results - College Football at Sports-Reference.com". College Football at Sports-Reference.com. Retrieved November 2, 2017. ^ a b Pope, Edwin (November 10, 2007). "Plenty of Memories". The Miami Herald. Retrieved October 13, 2009. ^ "1947 Miami (FL) Hurricanes Schedule and Results - College Football at Sports-Reference.com". College Football at Sports-Reference.com. Retrieved November 2, 2017. ^ "Jack Harding Coaching Record - College Football at Sports-Reference.com". College Football at Sports-Reference.com. Retrieved November 2, 2017. ^ a b c Hickman, Herman (April 11, 1955). "Drive at Miami: Coach Andy Gustafson has the system and the men". Sports Illustrated. Retrieved October 13, 2009. ^ Hickman, Herman (April 11, 1955). "The Theory Of The Drive Series". Sports Illustrated. Retrieved October 13, 2009. ^ "Miami Bowl History". HurricaneSports.com. Archived from the original on March 9, 2012. Retrieved October 13, 2009. ^ a b "Arbitrary, To Say The Least – Harding". Ocala Star-Banner. Associated Press. November 14, 1956. Archived from the original on January 24, 2013. Retrieved October 13, 2009. ^ "1954 Miami (FL) Hurricanes Schedule and Results - College Football at Sports-Reference.com". College Football at Sports-Reference.com. Retrieved November 2, 2017. ^ "1956 Miami (FL) Hurricanes Schedule and Results - College Football at Sports-Reference.com". College Football at Sports-Reference.com. Retrieved November 2, 2017. ^ "Don Bosseler - University of Miami Sports Hall of Fame". UM Sports Hall of Fame. Retrieved November 2, 2017. ^ Reisler, Jim (December 20, 2007). "Paying Homage to Visions of Bowl Games Gone By". The New York Times. Retrieved October 13, 2009. ^ Sheehan, Joseph (December 16, 1961). "Liberty Bowl 1961: Syracuse 15, Miami 14". The New York Times. Archived from the original on January 11, 2009. Retrieved October 13, 2009. ^ "1963 Miami (FL) Hurricanes Schedule and Results - College Football at Sports-Reference.com". College Football at Sports-Reference.com. Retrieved November 2, 2017. ^ "Heisman History...1960 to 1969". Scout.com. December 7, 2008. Archived from the original on December 17, 2009. Retrieved October 13, 2009. ^ "Special Issue: College Football". Sports Illustrated. September 23, 1963. Retrieved October 14, 2009. ^ "Georgia Tech Aide Named Miami Coach". New York Times. December 24, 1963. p. 12. Retrieved February 7, 2010. ^ "Andy Gustafson - University of Miami Sports Hall of Fame". UM Sports Hall of Fame. Retrieved November 2, 2017. ^ "Hall of Fame Hurricanes: Andy Gustafson". hurricanesports.com. Retrieved November 2, 2017. ^ "Andy Gustafson Dies; Former Coach at Miami". NY Times. ^ "1964 Miami (FL) Hurricanes Schedule and Results - College Football at Sports-Reference.com". College Football at Sports-Reference.com. Retrieved November 2, 2017. ^ "1965 Miami (FL) Hurricanes Schedule and Results - College Football at Sports-Reference.com". College Football at Sports-Reference.com. Retrieved November 2, 2017. ^ "Hall of Fame Hurricanes: Ted Hendricks". hurricanesports.com. Retrieved November 2, 2017. ^ a b c d e f g h i j k l m n o p q r s t u v Feldman, Bruce (2004). Cane Mutiny: How the Miami Hurricanes Overturned the Football Establishment. New York: New American Library. ISBN 0-451-21297-5. ^ "Hurricanes Football Bowl History". hurricanesports.com. Retrieved November 2, 2017. ^ "1968 Miami (FL) Hurricanes Schedule and Results - College Football at Sports-Reference.com". College Football at Sports-Reference.com. Retrieved November 2, 2017. ^ "1969 Miami (FL) Hurricanes Schedule and Results - College Football at Sports-Reference.com". College Football at Sports-Reference.com. Retrieved November 2, 2017. ^ Hairston, Jack (April 19, 1988). "A Hall of Famer recalls the highlights". Gainesville Sun. Retrieved October 14, 2009. ^ "1970 Miami (FL) Hurricanes Schedule and Results - College Football at Sports-Reference.com". College Football at Sports-Reference.com. Retrieved November 2, 2017. ^ "Curci Leaves Post at Tampa To Coach Football at Miami". NY Times. ^ a b c "Florida–Miami rivalry has bitter history". ESPN.com. September 5, 2003. Retrieved October 15, 2009. ^ Feldman, Bruce (2004). Cane Mutiny: How the Miami Hurricanes Overturned the Football Establishment. New York: New American Library. p. 4. ISBN 0-451-21297-5. ^ "Tulane Football History". TulaneGreenWave.com. Archived from the original on March 31, 2016. Retrieved October 14, 2009. ^ Nelson, David M. (October 14, 1990). "Fifth Down or Not, It's Over When It's Over". The New York Times. Retrieved October 14, 2009. ^ a b "2008 Football Media Guide" (PDF). July 28, 2008. p. 159. Retrieved November 7, 2009. ^ "1975 Miami (FL) Hurricanes Schedule and Results - College Football at Sports-Reference.com". College Football at Sports-Reference.com. Retrieved November 2, 2017. ^ "1976 Miami (FL) Hurricanes Schedule and Results - College Football at Sports-Reference.com". College Football at Sports-Reference.com. Retrieved November 2, 2017. ^ a b Feldman, Bruce (2004). Cane Mutiny: How the Miami Hurricanes Overturned the Football Establishment. New York: New American Library. pp. 17–18. ISBN 0-451-21297-5. ^ White, Gordon (January 5, 1979). "Army Hires Saban of Miami as 28th Football Coach; 9 Jobs in 29 Years 'Longer Than Homer's' Boston Patriots' Coach". The New York Times. p. A13. Retrieved February 5, 2010. ^ a b Feldman, Bruce (2004). Cane Mutiny: How the Miami Hurricanes Overturned the Football Establishment. New York: New American Library. p. 18. ISBN 0-451-21297-5. ^ "FAUSPORTS.COM Howard Schnellenberger Bio :: Florida Atlantic University Official Athletic Site Florida Atlantic University Official Athletic Site - Football". fausports.com. Retrieved November 2, 2017. ^ Hutton, Ted. "At every stop in his career, Schnellenberger watched and learned". sun-sentinel.com. Retrieved November 2, 2017. ^ "Coaching Legend Howard Schnellenberger Joins Scott, Jeremy and Jason". cbslocal.com. Retrieved November 2, 2017. ^ Feldman, Bruce (2004). Cane Mutiny: How the Miami Hurricanes Overturned the Football Establishment. New York: New American Library. p. 19. ISBN 0-451-21297-5. ^ a b c Feldman, Bruce (2004). Cane Mutiny: How the Miami Hurricanes Overturned the Football Establishment. New York: New American Library. p. 22. ISBN 0-451-21297-5. ^ Feldman, Bruce (2004). Cane Mutiny: How the Miami Hurricanes Overturned the Football Establishment. New York: New American Library. p. 24. ISBN 0-451-21297-5. ^ "1979 Miami (FL) Hurricanes Schedule and Results - College Football at Sports-Reference.com". College Football at Sports-Reference.com. Retrieved November 2, 2017. ^ Feldman, Bruce (2004). Cane Mutiny: How the Miami Hurricanes Overturned the Football Establishment. New York: New American Library. p. 31. ISBN 0-451-21297-5. ^ "1981 Miami (FL) Hurricanes Schedule and Results - College Football at Sports-Reference.com". College Football at Sports-Reference.com. Retrieved November 2, 2017. ^ "PENN STATE UPSET BY MIAMI, 17-14". The New York Times. November 1, 1981. Retrieved November 2, 2017. ^ "Miami Sets Back Irish, 37-15". NY Times. AP. ^ "1982 Miami (FL) Hurricanes Schedule and Results - College Football at Sports-Reference.com". College Football at Sports-Reference.com. Retrieved November 2, 2017. ^ "Bernie Kosar - University of Miami Sports Hall of Fame". UM Sports Hall of Fame. Retrieved November 2, 2017. ^ "Notre Dame Miami Football Rivalry // UHND.com". uhnd.com. August 21, 2015. Retrieved November 2, 2017. ^ a b c d O'Sullivan, Dan (December 13, 2002). "1984 – Miami 31, Nebraska 30". ABC Sports Online. Retrieved October 14, 2009. ^ a b "2008 UM Football Media Guide" (PDF). July 28, 2008. p. 160. Retrieved November 20, 2009. ^ a b Feldman, Bruce (2004). Cane Mutiny: How the Miami Hurricanes Overturned the Football Establishment. New York: New American Library. p. 55. ISBN 0-451-21297-5. ^ "1984 Miami (FL) Hurricanes Schedule and Results - College Football at Sports-Reference.com". College Football at Sports-Reference.com. Retrieved November 2, 2017. ^ Burke, Monte (September 11, 2009). "Sports' Greatest Comeback Wins". Forbes.com. Retrieved October 14, 2009. ^ Schwartz, Kris (May 18, 2006). "Hail Flutie". ESPN.com. Retrieved October 14, 2009. ^ Burchette, Jordan. "1985 – UCLA 39, Miami 37". ABCSports.com. Retrieved October 14, 2009. ^ "Florida-Miami Rivalry to Kick off 2019 Season in Orlando". Florida Gators. Retrieved November 2, 2017. ^ "Hurricanes Wipe Out Cincinnati". orlandosentinel.com. Retrieved November 2, 2017. ^ a b c d e Associated Press (September 5, 2007). "It's been 2 decades, and Miami–Oklahoma matchups still classic". Sporting News.com. Retrieved October 14, 2009. ^ "TESTAVERDE LEADS MIAMI". The New York Times. December 1, 1985. Retrieved November 2, 2017. ^ "52nd Annual Sugar Bowl Classic ~ January 1, 1986". AllStateSugarBowl.org. Archived from the original on October 15, 2009. Retrieved October 14, 2009. ^ "1986 – 52nd Award – Vinny Testaverde". Heisman.com. Archived from the original on October 4, 2013. Retrieved October 14, 2009. ^ a b c Weinreb, Michael. "The Night College Football Went to Hell". ESPN.com. Retrieved October 14, 2009. ^ a b O'Sullivan, Dan (December 13, 2002). "1987 – Penn State 14, Miami 10". ABCSports.com. Retrieved October 14, 2009. ^ "16th Annual Fiesta Bowl". FiestaBowl.org. Archived from the original on July 20, 2011. Retrieved October 14, 2009. ^ "ABC Sports - Flashback: Miami-Florida State 1987". www.espn.com. Retrieved November 2, 2017. ^ "Talent-filled 1987 Miami–Florida State game now distant past". Sporting News.com. October 19, 2007. Retrieved October 14, 2009. ^ Moran, Malcolm (September 18, 1988). "Miami Rallies To Win". The New York Times. Retrieved October 14, 2009. ^ White Jr., Gordon S. (October 17, 1988). "Irish Hang On for an Astonishing Upset". The New York Times. Retrieved October 14, 2009. ^ Telander, Rick (October 24, 1988). "Pluck of the Irish – Spunky Notre Dame laid claim to the top spot in the national rankings by outlasting No. 1 Miami 31–30". Sports Illustrated. Retrieved October 10, 2009. ^ "Cowboys' Buyer Hires a New Coach". The New York Times. February 26, 1989. Retrieved November 2, 2017. ^ "Jimmy Johnson Coaching Record - College Football at Sports-Reference.com". College Football at Sports-Reference.com. Retrieved November 2, 2017. ^ Feldman, Bruce (2004). Cane Mutiny: How the Miami Hurricanes Overturned the Football Establishment. New York: New American Library. p. 92. ISBN 0-451-21297-5. ^ a b "56th Annual Sugar Bowl Classic ~ January 1, 1990". AllStateSugarBowl.org. Archived from the original on October 14, 2009. Retrieved October 14, 2009. ^ "Craig Erickson - University of Miami Sports Hall of Fame". UM Sports Hall of Fame. Retrieved November 2, 2017. ^ a b "ABC Sports - Through the years: Miami vs. Florida State". www.espn.com. Retrieved November 2, 2017. ^ WOJCIECHOWSKI, GENE (November 26, 1989). "Miami Exacts Its Revenge, 27-10 : Hurricanes: Seventh-ranked squad ends Notre Dame's winning streak and reign as top-ranked team". Retrieved November 2, 2017 – via LA Times. ^ Laracy, Alex (December 13, 2002). "1990 – Miami 33, Alabama 25". ABCSports.com. Retrieved October 14, 2009. ^ Hersch, Hank (September 17, 1990). "Tying One On: Quarterback Ty Detmer led BYU to a stunning upset of the No. 1 team". Sports Illustrated. Retrieved October 14, 2009. ^ "Great and Passionate Rivalry Will End Saturday With Miami–Notre Dame Game". Los Angeles Times. October 18, 1990. Retrieved October 15, 2009. ^ McNabb, David (January 2, 1991). "Hurricanes wreak havoc in Cotton". The Dallas Morning News. Retrieved October 14, 2009. ^ Wojciechowski, Gene (September 5, 1991). "Upon Further Review, Coach Says Referee Blew the Call". Los Angeles Times. Retrieved October 14, 2009. ^ Looney, Douglas S. "STORMING INTO THE BIG EAST". si.com. Retrieved November 2, 2017. ^ "1991 Miami (FL) Hurricanes Schedule and Results - College Football at Sports-Reference.com". College Football at Sports-Reference.com. Retrieved November 2, 2017. ^ Moran, Malcolm (November 17, 1991). "Miami Wins, 17–16, to Capture All the Oranges". The New York Times. Retrieved August 12, 2009. ^ "1992 - Orange Bowl". game.orangebowl.org. Retrieved November 2, 2017. ^ News, A. B. C. (August 24, 2017). "Hurricane Andrew 25 years later: The monster storm that devastated South Miami". ABC News. Retrieved November 2, 2017. ^ "1992 Miami (FL) Hurricanes Schedule and Results - College Football at Sports-Reference.com". College Football at Sports-Reference.com. Retrieved November 2, 2017. ^ "1992 – 57th Award – Gino Torretta". Heisman.com. Archived from the original on December 15, 2009. Retrieved October 14, 2009. ^ "59th Annual Sugar Bowl Classic ~ January 1, 1993". AllStateSugarBowl.org. Archived from the original on September 24, 2010. Retrieved October 14, 2009. ^ a b Murphy, Austin (January 11, 1993). "The End of the Run". Sports Illustrated. Retrieved October 14, 2009. ^ Staff, From; Reports, Wire (December 22, 1992). "Miami Assistant Gets Colorado State Job". Retrieved November 2, 2017 – via LA Times. ^ "1993 Miami (FL) Hurricanes Schedule and Results - College Football at Sports-Reference.com". College Football at Sports-Reference.com. Retrieved November 2, 2017. ^ Price, S.L. (April 14, 1994). "Hurricane Warning". Sports Illustrated. Retrieved October 14, 2009. ^ "COLLEGE FOOTBALL: AROUND THE NATION; Miami Sets Record With Rout at Home". NY Times. Associated =Press. ^ Price, S.L. (October 3, 1994). "Dog Day Afternoon". Sports Illustrated. Retrieved October 14, 2009. ^ "Warren Sapp - University of Miami Sports Hall of Fame". UM Sports Hall of Fame. Retrieved November 2, 2017. ^ "Ray Lewis - University of Miami Sports Hall of Fame". UM Sports Hall of Fame. Retrieved November 2, 2017. ^ a b Feldman, Bruce (2004). Cane Mutiny: How the Miami Hurricanes Overturned the Football Establishment. New York: New American Library. p. 145. ISBN 0-451-21297-5. ^ "Erickson Is Named Coach of Seahawks". NY Times. Associated Press. ^ "Dennis Erickson Coaching Record - College Football at Sports-Reference.com". College Football at Sports-Reference.com. Retrieved November 2, 2017. ^ "Despite leaving football, Sonny Lubick has not stopped winning". collegian.com. Retrieved November 2, 2017. ^ NACK, WILLIAM. "TOUGH LOVE COACH BUTCH DAVIS AIMS TO SAVE MIAMI FOOTBALL NO MATTER HOW MANY PLAYERS HE HAS TO SUSPEND". si.com. Retrieved November 2, 2017. ^ "1995 Miami (FL) Hurricanes Schedule and Results - College Football at Sports-Reference.com". College Football at Sports-Reference.com. Retrieved November 2, 2017. ^ a b "Miami Takes Its Punishment Sooner, Rather Than Later". The New York Times. December 2, 1995. Retrieved November 2, 2017. ^ Holiday, Pete. Football's Dirtiest Programs: #10, Miami. FanHouse, July 23, 2007. ^ a b c "Why the University of Miami should drop football". CNNSI.com. June 12, 1995. Archived from the original on April 15, 2008. Retrieved November 11, 2006. ^ Feldman, Bruce (2004). Cane Mutiny: How the Miami Hurricanes Overturned the Football Establishment. New York: New American Library. pp. 131–33, 144, 156–57, 166. ISBN 0-451-21297-5. ^ Cotton, Anthony (August 20, 1996). "MIAMI HURRICANES TRYING TO TURN THE TIDE". Retrieved November 2, 2017 – via www.washingtonpost.com. ^ "Miami Suspends Receiver For Season After His Arrest". The New York Times. June 22, 1996. Retrieved November 2, 2017. ^ "1996 Miami (FL) Hurricanes Schedule and Results - College Football at Sports-Reference.com". College Football at Sports-Reference.com. Retrieved November 2, 2017. ^ Nack, William (August 19, 1996). "Though Love: Coach Butch Davis aims to save Miami football no matter how many players he has to suspend". Sports Illustrated. Retrieved October 20, 2009. ^ "1997 Miami (FL) Hurricanes Schedule and Results - College Football at Sports-Reference.com". College Football at Sports-Reference.com. Retrieved November 2, 2017. ^ a b Long, Mark (October 8, 2001). "Miami–Florida State Rivalry Back to Life". TheACC.com. Associated Press. Archived from the original on December 31, 2010. Retrieved October 12, 2009. ^ a b Maisel, Ivan (October 13, 1997). "Blown-out Hurricanes". Sports Illustrated. Retrieved October 12, 2009. ^ "1998 Miami (FL) Hurricanes Schedule and Results - College Football at Sports-Reference.com". College Football at Sports-Reference.com. Retrieved November 2, 2017. ^ CROWE, JERRY (September 25, 1998). "UCLA Game Canceled, by Georges". Retrieved November 2, 2017 – via LA Times. ^ "McNabb Enjoys a Blowout at Miami's Expense". The New York Times. November 29, 1998. Retrieved November 2, 2017. ^ Nobles, Charlie. "COLLEGE FOOTBALL; Miami and James Overcome McNown". NY Times. ^ Smith, Timothy W. "COLLEGE FOOTBALL; Miami Gets It Together As Ohio St. Falls Apart". NY Times. ^ Nobles, Charlie. "COLLEGE FOOTBALL; It's Up, It's Good: Penn State Beats Miami on a 79-Yard Pass Play With 1:41 to Go". NY Times. ^ "Hurricanes Top Yellow Jackets In Gator Bowl, 28-13". HurricaneSports.com. Retrieved November 2, 2017. ^ "NCAA Football - Florida State vs. Miami (Fla.)". usatoday30.USAToday.com. Retrieved November 2, 2017. ^ News, A. B. C. (January 7, 2006). "Oklahoma Tops FSU for National Championship". ABC News. Retrieved November 2, 2017. ^ Services, Times Wire (December 29, 2000). "Bourbon Street Brawl Stirs Up Sugar". Retrieved November 2, 2017 – via LA Times. ^ "Bowl Championship Series - Miami 37, Florida 20". www.ESPN.com. Retrieved November 2, 2017. ^ "Browns Hire Miami's Davis To Be Coach". The New York Times. January 30, 2001. Retrieved November 2, 2017. ^ Feldman, Bruce (2004). Cane Mutiny: How the Miami Hurricanes Overturned the Football Establishment. New York: New American Library. p. 178. ISBN 0-451-21297-5. ^ Lapointe, Joe. "COLLEGE FOOTBALL; Miami Flexes Its Muscles to Crush Penn State". NY Times. ^ "Rutgers vs. Miami - Game Summary - September 8, 2001 - ESPN". ESPN.com. Retrieved November 2, 2017. ^ "Miami vs. Pittsburgh - Game Summary - September 27, 2001 - ESPN". ESPN.com. Retrieved November 2, 2017. ^ "Troy vs. Miami - Game Summary - October 6, 2001 - ESPN". ESPN.com. Retrieved November 2, 2017. ^ "Miami vs. Florida State - Game Summary - October 13, 2001 - ESPN". ESPN.com. Retrieved November 2, 2017. ^ "No. 1 Hurricanes Stomp West Virginia, 45-3 - University of Miami". University of Miami. ^ "No. 1 Miami Blanks Temple, 38-0". hurricanesports.com. Retrieved November 2, 2017. ^ "Ed Reed's 2001 Miami Hurricanes dominated like few teams, but are they the best ever?". nola.com. Retrieved November 2, 2017. ^ "Syracuse vs. Miami - Game Summary - November 17, 2001 - ESPN". ESPN.com. Retrieved November 2, 2017. ^ "NCAA Football - Washington vs. Miami (Fla.)". usatoday30.usatoday.com. Retrieved November 2, 2017. ^ Schlabach, Mark (May 21, 2008). "2001 Hurricanes cream of BCS champions crop". ESPN.com. Retrieved October 17, 2009. ^ Adelson, Andrea (July 2, 2009). "Team of the decade: The 2001 Miami Hurricanes". Orlando Sentinel. Archived from the original on July 5, 2009. Retrieved October 17, 2009. ^ "NCAA Football - Miami (Fla.) vs. Virginia Tech". usatoday30.usatoday.com. Retrieved November 2, 2017. ^ "Intense Miami-Nebraska rivalry dates back to epic 1984 Orange Bowl". si.com. Retrieved November 2, 2017. ^ "Character, Class And Poise = Championship". Hurricanesports.com. July 24, 2007. Archived from the original on November 14, 2007. Retrieved July 24, 2007. ^ a b "University of Miami Hurricanes Official Athletic Site". www.hurricanesports.com. Retrieved November 2, 2017. ^ "USC's Place In History: 2001 Miami". ESPN.com. July 24, 2007. Archived from the original on June 26, 2006. Retrieved July 24, 2007. ^ "Miami Ranked 1st In Associated Press Preseason Football Poll!". hurricanesports.com. Retrieved November 2, 2017. ^ "Jonathan Vilma - University of Miami Sports Hall of Fame". UM Sports Hall of Fame. Retrieved November 2, 2017. ^ "Miami vs. Florida - Game Summary - September 7, 2002 - ESPN". ESPN.com. Retrieved November 2, 2017. ^ "Florida State vs. Miami - Game Summary - October 12, 2002 - ESPN". ESPN.com. Retrieved November 2, 2017. ^ "WIDE LEFT! Hurricanes Edge Florida State, 28-27". hurricanesports.com. Retrieved November 2, 2017. ^ "Miami vs. Tennessee - Game Recap - November 9, 2002 - ESPN". ESPN.com. Retrieved November 2, 2017. ^ "Virginia Tech vs. Miami - Game Summary - December 7, 2002 - ESPN". ESPN.com. Retrieved November 2, 2017. ^ "No Surprises In Finalists For Heisman". The New York Times. December 12, 2002. Retrieved November 2, 2017. ^ "Ravens' Willis McGahee hospitalized after scary hit in AFC title game". New York Daily News. January 19, 2009. Retrieved October 17, 2009. ^ a b c d e f Daughters, Amy. "A Questionable Call That Ended a Dynasty: Miami vs. Ohio State, 2003 Fiesta Bowl". bleacherreport.com. Retrieved November 2, 2017. ^ "Michael McKnight: An oral history of 2003 title game between Miami, Ohio State". si.com. Retrieved November 2, 2017. ^ "Miami vs. Virginia Tech - Game Recap - November 1, 2003 - ESPN". ESPN.com. Retrieved November 2, 2017. ^ "Tennessee vs. Miami - Game Recap - November 8, 2003 - ESPN". ESPN.com. Retrieved November 2, 2017. ^ "2003 Miami (FL) Hurricanes Schedule and Results - College Football at Sports-Reference.com". College Football at Sports-Reference.com. Retrieved November 2, 2017. ^ "Miami vs. Florida State - Game Recap - January 1, 2004 - ESPN". ESPN.com. Retrieved November 2, 2017. ^ "Miami to Join A.C.C. ; Shift of Power Expected". The New York Times. July 1, 2003. Retrieved November 2, 2017. ^ "History - Chick-fil-A Peach Bowl". chick-fil-apeachbowl.com. August 12, 2015. Retrieved November 2, 2017. ^ "Wrong Time For Wright". orlandosentinel.com. Retrieved November 2, 2017. ^ "Miami vs. Florida State - Game Recap - September 5, 2005 - ESPN". ESPN.com. Retrieved November 2, 2017. ^ "Miami vs. Virginia Tech - Game Recap - November 5, 2005 - ESPN". ESPN.com. Retrieved November 2, 2017. ^ "Georgia Tech vs. Miami - Game Summary - November 19, 2005 - ESPN". ESPN.com. Retrieved November 2, 2017. ^ "Miami vs. LSU - Game Recap - December 30, 2005 - ESPN". ESPN.com. Retrieved November 2, 2017. ^ a b Pat Forde. "Rap recording could threaten Miami's progress". ESPN.com. Retrieved November 19, 2013. ^ "Nothing Shocking About 'Crew'". November 18, 2005. Retrieved May 21, 2011. ^ "2006 Miami (FL) Hurricanes Schedule and Results - College Football at Sports-Reference.com". College Football at Sports-Reference.com. Retrieved November 2, 2017. ^ "Brawl breaks out during Miami-FIU game". ESPN.com. October 15, 2006. Retrieved November 2, 2017. ^ "Miami senior lineman shot; death ruled homicide". ESPN.com. November 8, 2006. Retrieved November 2, 2017. ^ "Boston College vs. Miami - Game Recap - November 23, 2006 - ESPN". ESPN.com. Retrieved November 2, 2017. ^ Nobles, Charlie (November 24, 2006). "University of Miami Fires Coach Larry Coker". New York Times. Retrieved February 5, 2010. ^ "Miami vs. Nevada - Game Summary - December 31, 2006 - ESPN". ESPN.com. Retrieved November 2, 2017. ^ REYNOLDS, TIM (December 8, 2006). "Report: Shannon Hired as Miami Coach". Retrieved November 2, 2017 – via www.washingtonpost.com. ^ Mark Schlabach & Joe Schad (December 7, 2006). "Defensive coordinator Shannon new Miami Coach". ESPN.com. The Associated Press. Retrieved December 7, 2006. ^ "Shannon introduced as Miami coach". ESPN.com. December 8, 2006. Retrieved November 2, 2017. ^ "Schlabach: Shannon issues tougher rules for Canes". ESPN.com. July 24, 2007. Retrieved November 2, 2017. ^ "2007 Miami (FL) Hurricanes Schedule and Results - College Football at Sports-Reference.com". College Football at Sports-Reference.com. Retrieved November 2, 2017. ^ "2008 Team Rankings". Rivals.com. March 19, 2008. Retrieved December 10, 2009. ^ "2008 Miami (FL) Hurricanes Schedule and Results - College Football at Sports-Reference.com". College Football at Sports-Reference.com. Retrieved November 2, 2017. ^ "Miami vs. Florida - Game Recap - September 6, 2008 - ESPN". ESPN.com. Retrieved November 2, 2017. ^ "Florida State vs. Miami - Game Recap - October 4, 2008 - ESPN". ESPN.com. Retrieved November 2, 2017. ^ "Virginia Tech vs. Miami - Game Recap - November 13, 2008 - ESPN". ESPN.com. Retrieved November 2, 2017. ^ "Randy Shannon vs. Urban Meyer". sun-sentinel.com. Retrieved November 2, 2017. ^ Lily. "Let's End This Randy Shannon Vs. Urban Meyer Debate Already!". bleacherreport.com. Retrieved November 2, 2017. ^ a b Stoda, George (September 10, 2008). "UM's Randy Shannon shouldn't complain about Gators running up score". Palm Beach Post. Retrieved June 14, 2009. ^ "Sapp rips Florida for late field goal". St. Petersburg Times. September 12, 2008. Archived from the original on October 13, 2012. Retrieved June 14, 2009. ^ "Georgia Tech racks up 473 rushing yards, dampers No. 23 Miami's ACC title hopes". ESPN.com. November 20, 2008. Retrieved February 19, 2009. ^ "Miami vs. California - Game Recap - December 27, 2008 - ESPN". ESPN.com. Retrieved November 2, 2017. ^ "(dead link)". Miami Herald. ^ "Robert Marve leaving Miami; 'Canes set tight transfer restrictions". Tampa Bay Times. Archived from the original on June 7, 2011. ^ Joey Johnston (December 31, 2008). "Drama-Filled Marve Saga at UM Comes to End'". Tampa Tribune. Archived from the original on February 3, 2013. Retrieved December 31, 2008. ^ Wetzel, Dan (January 2, 2009). "Block on Marve transfer out of bounds – College Football – Rivals.com". Rivals.yahoo.com. Retrieved July 19, 2012. ^ Wojciechowski, Gene (January 7, 2009). "Hurricanes send warning signals". ESPN. Retrieved September 23, 2009. ^ "Canes choose Lovett as D.C." CNN Sports Illustrated. Associated Press. February 9, 2009. Archived from the original on February 12, 2009. Retrieved September 23, 2009. ^ "Miami's new offensive coordinator is a hit, in theory". yahoo.com. Retrieved November 2, 2017. ^ "Whipple to run Miami's offense". ESPN. Associated Press. January 27, 2009. Retrieved September 23, 2009. ^ Shipley, Amy (September 24, 2009). "'Canes Eyeing Return to Glory". Washington Post. p. D1. ^ "Dust Settles after the Exodus". stateoftheu.com. Retrieved November 2, 2017. ^ "'Canes Adewale Ojomo back after broken jaw". sun-sentinel.com. Retrieved November 2, 2017. ^ "Miami (FL) 2012 Schedule - Hurricanes Home and Away - ESPN". Espn.go.com. Retrieved July 19, 2012. ^ "Who has the toughest road in 2009? - College Football - ESPN". Sports.espn.go.com. September 1, 2009. Retrieved July 19, 2012. ^ Wilson, Mitch. "From Unbeateable to Rebuilding: The Miami Hurricane Story". bleacherreport.com. Retrieved November 2, 2017. ^ "Miami vs. Florida State - Game Recap - September 7, 2009 - ESPN". ESPN.com. Retrieved November 2, 2017. ^ "Georgia Tech vs. Miami - Game Recap - September 17, 2009 - ESPN". ESPN.com. Retrieved November 2, 2017. ^ "Miami vs. Virginia Tech - Game Recap - September 26, 2009 - ESPN". ESPN.com. Retrieved November 2, 2017. ^ "Sam Bradford - Heisman Winners". heisman.com. Retrieved November 2, 2017. ^ "Oklahoma vs. Miami - Game Summary - October 3, 2009 - ESPN". ESPN.com. Retrieved November 2, 2017. ^ "Florida A&M vs. Miami - Game Recap - October 10, 2009 - ESPN". ESPN.com. Retrieved November 2, 2017. ^ "Miami vs. UCF - Game Recap - October 17, 2009 - ESPN". ESPN.com. Retrieved November 2, 2017. ^ "Clemson Shocks No. 8 Miami, 40-37 In Overtime". ncaa.com. October 24, 2009. Retrieved November 2, 2017. ^ "Miami vs. Wake Forest - Game Recap - October 31, 2009 - ESPN". ESPN.com. Retrieved November 2, 2017. ^ "Virginia vs. Miami - Game Recap - November 7, 2009 - ESPN". ESPN.com. Retrieved November 2, 2017. ^ "Miami vs. North Carolina - Game Recap - November 14, 2009 - ESPN". ESPN.com. Retrieved November 2, 2017. ^ "Duke vs. Miami - Game Recap - November 21, 2009 - ESPN". ESPN.com. Retrieved November 2, 2017. ^ "Miami vs. South Florida - Game Recap - November 28, 2009 - ESPN". ESPN.com. Retrieved November 2, 2017. ^ "2009 Miami (FL) Hurricanes Schedule and Results - College Football at Sports-Reference.com". College Football at Sports-Reference.com. Retrieved November 2, 2017. ^ Smits, Garry. "Bobby Bowden's final game as Florida State coach likely in the Gator Bowl". jacksonville.com. Retrieved July 19, 2012. ^ "Champs Sports Bowl: Miami takes on Wisconsin". December 29, 2009. Retrieved November 2, 2017 – via LA Times. ^ "Miami vs. Wisconsin - Game Recap - December 29, 2009 - ESPN". ESPN.com. Retrieved November 2, 2017. ^ "College Football Class Rankings 2013 - ESPN". Insider.espn.go.com. Retrieved July 19, 2012. ^ "Cardinals tab Tommie Robinson to coach RBs | ProFootballTalk". Profootballtalk.nbcsports.com. February 5, 2010. Retrieved July 19, 2012. ^ "The University of Miami brings back Rick Petri to coach defensive line – ESPN". Sports.espn.go.com. January 28, 2010. Retrieved July 19, 2012. ^ "Carol City's Aubrey Hill gets to start over". miamiherald.com. Retrieved November 2, 2017. ^ "Shannon signs deal with Miami". ESPN News. Associated Press. May 13, 2010. Retrieved December 17, 2010. ^ "2010 Miami (FL) Hurricanes Schedule and Results - College Football at Sports-Reference.com". College Football at Sports-Reference.com. Retrieved November 2, 2017. ^ "Florida State vs. Miami - Game Recap - October 9, 2010 - ESPN". ESPN.com. Retrieved November 2, 2017. ^ "Virginia Tech vs. Miami - Game Recap - November 20, 2010 - ESPN". ESPN.com. Retrieved November 2, 2017. ^ "South Florida vs. Miami - Game Recap - November 27, 2010 - ESPN". ESPN.com. Retrieved November 2, 2017. ^ "Miami fires coach Shannon after finishing 7-5". ESPN.com. November 28, 2010. Retrieved November 2, 2017. ^ "Notre Dame vs. Miami - Game Recap - December 31, 2010 - ESPN". ESPN.com. Retrieved November 2, 2017. ^ "Miami chooses Temple's Golden as new coach". ESPN.com. December 12, 2010. Retrieved November 2, 2017. ^ "Miami Makes It Official, Names Al Golden New Head Coach". SBNation.com. Retrieved November 2, 2017. ^ "Al Golden contract extension: Miami gives football coach Al Golden a 4-year-contract extension". orlandosentinel.com. Retrieved November 2, 2017. ^ "2011 Miami (FL) Hurricanes Schedule and Results - College Football at Sports-Reference.com". College Football at Sports-Reference.com. Retrieved November 2, 2017. ^ "Miami vs. Maryland - Game Recap - September 5, 2011 - ESPN". ESPN.com. Retrieved November 2, 2017. ^ "Ohio State vs. Miami - Game Recap - September 17, 2011 - ESPN". ESPN.com. Retrieved November 2, 2017. ^ "Kansas State vs. Miami - Game Recap - September 24, 2011 - ESPN". ESPN.com. Retrieved November 2, 2017. ^ "Bethune-Cookman vs. Miami - Game Recap - October 1, 2011 - ESPN". ESPN.com. Retrieved November 2, 2017. ^ "Miami vs. Virginia Tech - Game Recap - October 8, 2011 - ESPN". ESPN.com. Retrieved November 2, 2017. ^ "Miami vs. North Carolina - Game Recap - October 15, 2011 - ESPN". ESPN.com. Retrieved November 2, 2017. ^ "Georgia Tech vs. Miami - Game Summary - October 22, 2011 - ESPN". ESPN.com. Retrieved November 2, 2017. ^ "Virginia vs. Miami - Game Recap - October 27, 2011 - ESPN". ESPN.com. Retrieved November 2, 2017. ^ "Duke vs. Miami - Game Recap - November 5, 2011 - ESPN". ESPN.com. Retrieved November 2, 2017. ^ "Miami vs. Florida State - Game Recap - November 12, 2011 - ESPN". ESPN.com. Retrieved November 2, 2017. ^ "Miami vs. South Florida - Game Recap - November 19, 2011 - ESPN". ESPN.com. Retrieved November 2, 2017. ^ "Boston College vs. Miami - Game Recap - November 25, 2011 - ESPN". ESPN.com. Retrieved November 2, 2017. ^ "Golden, Canes agree on extension through '20". espn.com. Retrieved November 2, 2017. ^ "2012 Miami (FL) Hurricanes Schedule and Results - College Football at Sports-Reference.com". College Football at Sports-Reference.com. Retrieved November 2, 2017. ^ "Miami vs. Boston College - Game Recap - September 1, 2012 - ESPN". ESPN.com. Retrieved November 2, 2017. ^ "Miami vs. Kansas State - Game Recap - September 8, 2012 - ESPN". ESPN.com. Retrieved November 2, 2017. ^ "Bethune-Cookman vs. Miami - Game Recap - September 15, 2012 - ESPN". ESPN.com. Retrieved November 2, 2017. ^ "Miami vs. Georgia Tech - Game Recap - September 22, 2012 - ESPN". ESPN.com. Retrieved November 2, 2017. ^ "NC State vs. Miami - Game Recap - September 29, 2012 - ESPN". ESPN.com. Retrieved November 2, 2017. ^ "Miami vs. Notre Dame - Game Recap - October 6, 2012 - ESPN". ESPN.com. Retrieved November 2, 2017. ^ "North Carolina vs. Miami - Game Recap - October 13, 2012 - ESPN". ESPN.com. Retrieved November 2, 2017. ^ "Florida State vs. Miami - Game Recap - October 20, 2012 - ESPN". ESPN.com. Retrieved November 2, 2017. ^ "Virginia Tech vs. Miami - Game Recap - November 1, 2012 - ESPN". ESPN.com. Retrieved November 2, 2017. ^ "Miami vs. Virginia - Game Recap - November 10, 2012 - ESPN". ESPN.com. Retrieved November 2, 2017. ^ "South Florida vs. Miami - Game Recap - November 17, 2012 - ESPN". ESPN.com. Retrieved November 2, 2017. ^ "Miami vs. Duke - Game Recap - November 24, 2012 - ESPN". ESPN.com. Retrieved November 2, 2017. ^ a b c d e "Miami Hurricanes lose scholarships but avoid bowl ban". miamiherald.com. Retrieved November 2, 2017. ^ "2013 Miami (FL) Hurricanes Schedule and Results - College Football at Sports-Reference.com". College Football at Sports-Reference.com. Retrieved November 2, 2017. ^ "Florida Atlantic vs. Miami - Game Recap - August 30, 2013 - ESPN". ESPN.com. Retrieved November 2, 2017. ^ "Florida vs. Miami - Game Recap - September 7, 2013 - ESPN". ESPN.com. Retrieved November 2, 2017. ^ "Savannah State vs. Miami - Game Recap - September 21, 2013 - ESPN". ESPN.com. Retrieved November 2, 2017. ^ "Miami vs. South Florida - Game Recap - September 28, 2013 - ESPN". ESPN.com. Retrieved November 2, 2017. ^ "Georgia Tech vs. Miami - Game Recap - October 5, 2013 - ESPN". ESPN.com. Retrieved November 2, 2017. ^ "Miami vs. North Carolina - Game Recap - October 17, 2013 - ESPN". ESPN.com. Retrieved November 2, 2017. ^ "Wake Forest vs. Miami - Game Recap - October 26, 2013 - ESPN". ESPN.com. Retrieved November 2, 2017. ^ "Miami vs. Florida State - Game Recap - November 2, 2013 - ESPN". ESPN.com. Retrieved November 2, 2017. ^ "Virginia Tech vs. Miami - Game Recap - November 9, 2013 - ESPN". ESPN.com. Retrieved November 2, 2017. ^ "Miami vs. Duke - Game Recap - November 16, 2013 - ESPN". ESPN.com. Retrieved November 2, 2017. ^ "Virginia vs. Miami - Game Recap - November 23, 2013 - ESPN". ESPN.com. Retrieved November 2, 2017. ^ "Miami vs. Pittsburgh - Game Recap - November 29, 2013 - ESPN". ESPN.com. Retrieved November 2, 2017. ^ "Miami vs. Louisville - Game Recap - December 28, 2013 - ESPN". ESPN.com. Retrieved November 2, 2017. ^ a b c "Miami avoids bowl ban, loses scholarships". espn.com. Retrieved November 2, 2017. ^ "2014 Miami (FL) Hurricanes Schedule and Results - College Football at Sports-Reference.com". College Football at Sports-Reference.com. Retrieved November 2, 2017. ^ "Miami vs. Louisville - Game Recap - September 1, 2014 - ESPN". ESPN.com. Retrieved November 2, 2017. ^ "Florida A&M vs. Miami - Game Recap - September 6, 2014 - ESPN". ESPN.com. Retrieved November 2, 2017. ^ "Arkansas State vs. Miami - Game Recap - September 13, 2014 - ESPN". ESPN.com. Retrieved November 2, 2017. ^ "Miami vs. Nebraska - Game Recap - September 20, 2014 - ESPN". ESPN.com. Retrieved November 2, 2017. ^ "Duke vs. Miami - Game Recap - September 27, 2014 - ESPN". ESPN.com. Retrieved November 2, 2017. ^ "Miami vs. Georgia Tech - Game Recap - October 4, 2014 - ESPN". ESPN.com. Retrieved November 2, 2017. ^ "Cincinnati vs. Miami - Game Recap - October 11, 2014 - ESPN". ESPN.com. Retrieved November 2, 2017. ^ "Miami vs. Virginia Tech - Game Recap - October 23, 2014 - ESPN". ESPN.com. Retrieved November 2, 2017. ^ "North Carolina vs. Miami - Game Recap - November 1, 2014 - ESPN". ESPN.com. Retrieved November 2, 2017. ^ "Florida State vs. Miami - Game Recap - November 15, 2014 - ESPN". ESPN.com. Retrieved November 2, 2017. ^ "Miami vs. Virginia - Game Recap - November 22, 2014 - ESPN". ESPN.com. Retrieved November 2, 2017. ^ "Pittsburgh vs. Miami - Game Recap - November 29, 2014 - ESPN". ESPN.com. Retrieved November 2, 2017. ^ "Miami vs. South Carolina - Game Recap - December 27, 2014 - ESPN". ESPN.com. Retrieved November 2, 2017. ^ "2015 Miami (FL) Hurricanes Schedule and Results - College Football at Sports-Reference.com". College Football at Sports-Reference.com. Retrieved November 2, 2017. ^ "From The Mag: Inside the years-long series of airborne insults that helped get Al Golden fired". espn.com. Retrieved November 2, 2017. ^ "Bethune-Cookman vs. Miami - Game Recap - September 5, 2015 - ESPN". ESPN.com. Retrieved November 2, 2017. ^ "Miami vs. Florida Atlantic - Game Recap - September 11, 2015 - ESPN". ESPN.com. Retrieved November 2, 2017. ^ "Nebraska vs. Miami - Game Recap - September 19, 2015 - ESPN". ESPN.com. Retrieved November 2, 2017. ^ "Miami vs. Cincinnati - Game Recap - October 1, 2015 - ESPN". ESPN.com. Retrieved November 2, 2017. ^ "Miami vs. Florida State - Game Recap - October 10, 2015 - ESPN". ESPN.com. Retrieved November 2, 2017. ^ "Virginia Tech vs. Miami - Game Recap - October 17, 2015 - ESPN". ESPN.com. Retrieved November 2, 2017. ^ "Clemson vs. Miami - Game Recap - October 24, 2015 - ESPN". ESPN.com. Retrieved November 2, 2017. ^ Bieler, Des (October 24, 2015). "How badly did Clemson embarrass Miami? Let us try to count the ways". Retrieved November 2, 2017 – via www.washingtonpost.com. ^ "Al Golden Coaching Record - College Football at Sports-Reference.com". College Football at Sports-Reference.com. Retrieved November 2, 2017. ^ "Interim coach Scott making mark in audition at Miami". si.com. Retrieved November 2, 2017. ^ "Miami vs. Duke - Game Recap - October 31, 2015 - ESPN". ESPN.com. ^ a b "A moment-by-moment breakdown of Miami's miracle". SB Nation. ^ Wire, SI. "Referees from Miami vs. Duke suspended two games". Sports Illustrated. ^ "Virginia vs. Miami - Game Recap - November 7, 2015 - ESPN". ESPN.com. Retrieved November 2, 2017. ^ "Miami vs. North Carolina - Game Recap - November 14, 2015 - ESPN". ESPN.com. Retrieved November 2, 2017. ^ "Georgia Tech vs. Miami - Game Recap - November 21, 2015 - ESPN". ESPN.com. Retrieved November 2, 2017. ^ "Miami vs. Pittsburgh - Game Recap - November 27, 2015 - ESPN". ESPN.com. Retrieved November 2, 2017. ^ "Miami vs. Washington State - Game Recap - December 26, 2015 - ESPN". ESPN.com. Retrieved November 2, 2017. ^ "Homecoming: Miami introduces Richt as its coach". espn.com. Retrieved November 2, 2017. ^ "Current and former Hurricanes react to Mark Richt choosing Miami". cbssports.com. Retrieved November 2, 2017. ^ "VIDEO: Students react to Mark Richt's hiring as Miami Hurricanes head coach". themiamihurricane.com. December 4, 2015. Retrieved November 2, 2017. ^ "Current, former UGA players react to Mark Richt to Miami news". seccountry.com. December 2, 2015. Retrieved November 2, 2017. ^ "Richt, Georgia parting ways after 15 seasons". espn.com. Retrieved November 2, 2017. ^ "Charlie Ward - Heisman Winners". heisman.com. Retrieved November 2, 2017. ^ "Chris Weinke - Heisman Winners". heisman.com. Retrieved November 2, 2017. ^ Hyde, Dave. "Hyde: Mark Richt's hiring shows Miami has entered big-money college football". sun-sentinel.com. Retrieved November 2, 2017. ^ "2016 Miami (FL) Hurricanes Schedule and Results - College Football at Sports-Reference.com". College Football at Sports-Reference.com. Retrieved November 2, 2017. ^ "Florida A&M vs. Miami - Game Recap - September 3, 2016 - ESPN". ESPN.com. Retrieved November 2, 2017. ^ "Florida Atlantic vs. Miami - Game Recap - September 10, 2016 - ESPN". ESPN.com. Retrieved November 2, 2017. ^ "Miami vs. Appalachian State - Game Recap - September 17, 2016 - ESPN". ESPN.com. Retrieved November 2, 2017. ^ "Miami vs. Georgia Tech - Game Recap - October 1, 2016 - ESPN". ESPN.com. Retrieved November 2, 2017. ^ "Florida State vs. Miami - Game Recap - October 8, 2016 - ESPN". ESPN.com. Retrieved November 2, 2017. ^ "North Carolina vs. Miami - Game Recap - October 15, 2016 - ESPN". ESPN.com. Retrieved November 2, 2017. ^ "Miami vs. Virginia Tech - Game Recap - October 20, 2016 - ESPN". ESPN.com. Retrieved November 2, 2017. ^ "Miami vs. Notre Dame - Game Recap - October 29, 2016 - ESPN". ESPN.com. Retrieved November 2, 2017. ^ "Pittsburgh vs. Miami - Game Recap - November 5, 2016 - ESPN". ESPN.com. Retrieved November 2, 2017. ^ "Miami vs. Virginia - Game Recap - November 12, 2016 - ESPN". ESPN.com. Retrieved November 2, 2017. ^ "Miami vs. NC State - Game Recap - November 19, 2016 - ESPN". ESPN.com. Retrieved November 2, 2017. ^ "Duke vs. Miami - Game Recap - November 26, 2016 - ESPN". ESPN.com. Retrieved November 2, 2017. ^ "West Virginia vs. Miami - Game Recap - December 28, 2016 - ESPN". ESPN.com. Retrieved November 2, 2017. ^ "2017 Miami (FL) Hurricanes Schedule and Results - College Football at Sports-Reference.com". College Football at Sports-Reference.com. ^ "Bethune-Cookman vs. Miami - Game Recap - September 2, 2017 - ESPN". ESPN.com. ^ "Miami-Arkansas State college game canceled due to Hurricane Irma". USA Today. ^ "Miami-Arkansas St. cancelled Due to Hurricane Irma". SI. ^ "Arkansas State sues Miami over canceled game". ESPN. ^ "Arkansas State threatens to sue Miami for canceled game". SI. ^ "Miami–FSU rescheduled for 10/7 due to Hurricane Irma". SI. ^ "Toledo vs. Miami - Game Recap - September 23, 2017 - ESPN". ESPN.com. ^ "Miami vs. Florida State - Game Recap - October 7, 2017 - ESPN". ESPN.com. ^ "Georgia Tech vs. Miami - Game Recap - October 14, 2017 - ESPN". ESPN.com. ^ "Syracuse vs. Miami - Game Recap - October 21, 2017 - ESPN". ESPN.com. ^ "Miami vs. North Carolina - Game Recap - October 28, 2017 - ESPN". ESPN.com. ^ "Virginia Tech vs. Miami - Game Recap - November 4, 2017 - ESPN". ESPN.com. ^ "Notre Dame vs. Miami - Game Recap - November 11, 2017 - ESPN". ESPN.com. ^ "Virginia vs. Miami - Game Recap - November 18, 2017 - ESPN". ESPN.com. ^ "Miami vs. Pittsburgh - Game Recap - November 24, 2017 - ESPN". ESPN.com. ^ "Miami vs. Clemson - Game Recap - December 2, 2017 - ESPN". ESPN.com. ^ "Wisconsin vs. Miami - Game Recap - December 30, 2017 - ESPN". ESPN.com. ^ "Miami signs Mark Richt to extension through 2023". SI. ^ "CaneSport.com - Richt Announces Retirement". miami.rivals.com. December 30, 2018. Retrieved February 1, 2019. ^ Christopher J. Walsh (2007). Who's #1? : 100-Plus Years of Controversial National Champions in College Football. Taylor Trade Pub. p. 43–45. ISBN 978-1-58979-337-8. ^ 2018 NCAA Football Bowl Subdivision Records (PDF). National Collegiate Athletic Association. August 2018. p. 114–115. Retrieved December 10, 2018. ^ a b c d e Harig, Bob (September 5, 2002). "UM-UF rivalry was once biggest in the state". ESPN.com. Retrieved October 15, 2009. ^ Associated Press (January 2, 2005). "Miami settles for 'state title' with Peach win". NBCSports.com. Retrieved October 15, 2009. ^ "Florida State vs. Miami - Game Summary - October 6, 2018 - ESPN". ESPN.com. Retrieved October 7, 2018. ^ "Miami Hurricanes Football Future Schedules". NationalChamps.net. Retrieved November 20, 2009. ^ "Florida, Miami (FL) finalize deal to open 2019 season in Orlando". Retrieved May 6, 2016. ^ "Winsipedia - Miami (FL) Hurricanes vs. Nebraska Cornhuskers football series history". Winspedia. ^ "Orange Bowl and Dolphin Stadium Side-by-Side". The Miami Hurricane. August 27, 2007. Retrieved October 14, 2009. ^ "Miami leaving Orange Bowl, will play in Dolphin Stadium". ESPN.com. Associated Press. August 21, 2007. Retrieved August 21, 2007. ^ "History of Miami Hurricanes stadiums". palmbeachpost.com. August 16, 2016. Retrieved January 5, 2017. ^ "Greentree Practice Fields Selected Best in College Football". HurricaneSports.com. January 22, 2007. Archived from the original on December 31, 2007. Retrieved October 14, 2009. ^ "$5M LEAD GIFT TO ESTABLISH SCHWARTZ CENTER FOR ATHLETIC EXCELLENCE - University of Miami Hurricanes Official Athletic Site". Hurricanesports.com. Retrieved September 13, 2016. ^ "UM Dedicates Schwartz Center for Athletic Excellence". www.businesswire.com. Retrieved November 14, 2017. ^ "NCAA Football Records (see page 213)" (PDF). NCAA Football records (see page 213). ^ "2006 University of Miami Football Media Guide: The History of Hurricanes Football" (PDF). Hurricanesports.com. Univ of Miami. Retrieved November 11, 2006. ^ "2018 Miami Hurricanes Media Guide" (PDF). University of Miami. Retrieved April 10, 2019. ^ a b c "Touchdown Club of Columbus". Tdccolumbus.com. February 6, 2016. Retrieved September 13, 2016. ^ a b c d e f g h i "Russell Maryland to be Inducted into College Football Hall of Fame". May 17, 2011. Archived from the original on May 22, 2011. Retrieved May 21, 2011. ^ "Hall of Fame elects Huskies' Don James". products.kitsapsun.com. ^ "Former Miami QB Testaverde heading to HOF - College Football Nation Blog- ESPN". Espn.go.com. May 6, 2013. Retrieved September 13, 2016. ^ Zrebiec, Jeff. "Former Ravens and Miami safety Ed Reed will be inducted into College Football Hall of Fame". Baltimore Sun. ^ "Jim Otto - Pro Football Hall of Fame Official Site". www.profootballhof.com. ^ "Ted Hendricks - Pro Football Hall of Fame Official Site". www.profootballhof.com. ^ "Jim Kelly - Pro Football Hall of Fame Official Site". www.profootballhof.com. ^ "Michael Irvin - Pro Football Hall of Fame Official Site". www.profootballhof.com. ^ a b "Cortez Kennedy - Pro Football Hall of Fame Official Site". www.profootballhof.com. ^ Cite error: The named reference https://www.profootballhof.com/players/ed-reed/ was invoked but never defined (see the help page). ^ "The Ring Of Honor". Archived from the original on December 9, 2009. Retrieved December 2, 2009. ^ "University of Miami Hurricanes Official Athletic Site". www.hurricanesports.com. ^ "Ring of Honor – Class of 2009". Hurricanesports.com. Archived from the original on July 25, 2012. Retrieved December 2, 2009. ^ "Miami's incredible turnover chain, explained". SI. ^ "Miami's NFL Draft History (07/24/07)". Hurricanesports.com. Archived from the original (PDF) on September 10, 2006. Retrieved November 11, 2006. ^ ":: Stats". Procanes.com. Retrieved July 19, 2012. ^ "SPORTS PEOPLE: FOOTBALL; Cash Bounties Reported at Miami". May 21, 1994 – via query.nytimes.com. ^ "31 Players were suspended for their involvement". Fox News. October 15, 2006. Retrieved May 21, 2007. ^ Robinson, Charles (August 16, 2011). "Renegade Miami football booster spells out illicit benefits to players". Yahoo! Sports. Retrieved August 16, 2011. ^ "ESPN Films: 30 for 30 Index". 30for30.espn.com. ^ "(rak on tur') – The U". Retrieved September 8, 2009. ^ Jackson, Barry (December 1, 2009). "University of Miami resists ESPN film, but will show it". Miami Herald. Retrieved December 4, 2009. ^ Antweil, Justin (December 11, 2009). "The U Documentary". Miami Hurricane. Retrieved December 12, 2009. ^ "Miami Hurricanes Football Schedules and Future Schedules". fbschedules.com. Retrieved January 11, 2018. ^ Chris Johnson (May 12, 2014). "ACC to stay at 8 conference games, require Power 5 opponent beginning in 2017". SI.com. Retrieved September 13, 2016. Wikimedia Commons has media related to Miami Hurricanes football.